Decades after Shah of Iran has been overthrown to accommodate implementation of certain policies in the region of Persian Gulf and Middle East to serve the interests of certain group of people in the world, we are still witness to the same propaganda nonsense that brought our nation to one of the lowest points in the history which is comparable to the times when Iran was overrun by Arab and Mongolian invaders centuries ago. To add more to this, one of the saddest issues of our time is glorification of ignorance under the guise of political correctness to justify and spread misinformation towards our history by some of the people who are expected to have better understanding of the political events but easily fall in the traps of false history which is fed to them through known or covert intelligence channels and propaganda. In fact, this is what paved the way for demise of our nation that was becoming prepared to enter a new era of prosperity and civilization while helping the rest of humanity in the quest for better world. All of that went down the drain and along with that, many other things throughout the world. At least for the last two centuries, the more advanced nations which had realized the importance and effect of intelligence and propaganda in their own affairs and the relations with other nations, have increasingly invoked these tools to further their own agendas and policies in order to protect and advance their own interests and achieve their desired objectives. The importance of control over information will become more obvious when considering that, more accurate knowledge on any issue can help making better decisions and also, getting better results while avoiding waste of resources in dealing with that. These are the fundamental principles to justify use of intelligence in any situation as much as possible and these are exact same principles to justify spread of counter intelligence and misinformation in order to avoid exposure of certain agendas by confusing a targeted people. One cannot expect that others provide useful and valid information openly about their own hidden agendas in any areas which might be harmful to or against the interest of others. Misinformation has proven to be one of the most valuable tools of propaganda and psychological warfare to mislead others about true intentions regarding any tactical or strategic operation. Yuri Alexandrovich Bezmenov is a former intelligence agent of Soviet Union who defected to the west during cold war and in his interviews; he has disclosed that only 15% of resources in the field of intelligence were assigned for actual spying activities while 85% were used for brainwashing and demoralization of target societies. This matter is not specific to former Soviets Union or Russians. All advanced nations with strong propaganda tools have been taking advantage of these methods against each other and also against other nations, to achieve their goals and objectives and they continue to do so today. Spread of misinformation to create uncertainty and confusion towards certain matters is an important part of any psychological warfare in order to manipulate and disable the forces of a targeted people which might otherwise pose a threat or create undesired problems. During the cold war era, Iran, as country which was at the forefront of conflicts between the East and the West, was under immense pressure by both sides of the quarrel and their internal elements. This issue created a lot of problems and restrictions for the nation in the areas of political and economic relations and developments. The problem had started right after end of WW II while Iran did not have enough time to recover from many of the major issues that she was facing as a result of decades (or even centuries) of corruption of ruling aristocracy and interference of greedy foreign powers. Before that, in the year 1941, Iran was forced to enter the war after being unjustly attacked and occupied by Allies, and break its neutrality to take side with the powerful invaders. This matter made it inevitable for Iran to become a field for future political games and manipulations by the great powers of the world and their agents inside the country. Presence of plenty of corrupt politicians among the ruling aristocrats which were all in love with the tribal traditions of hand kissing and servitude of subordinates while themselves would stop at nothing to please their own foreign masters, had made Iran a favorable place for covert or even open activities of colonialist and expansionist powers of the time since over a century earlier. Reza Shah Pahlavi became the Shah and top political figure in Iran after almost 150 years of Qajar's ruling of the country. His rise from the bottom of society to the top in fact might have been one of the reasons that, despite all his services in development of the country and saving the people from extreme misery of disease and poverty, he was strongly disliked by many among Iranian elite which mainly came from Qajar aristocrats. Neither Reza Shah nor any of his ancestors (as far as history can tell) was part of Iranian aristocracy to link him with one or another foreign powers. His father, Abas-ali, who was an officer of Iranian army during Qajar, died before his birth and his mother, Nushafarin khanum, decided to migrate from the village of Alasht to Tehran where her brother lived. Reza grew in extremely poor condition and experienced poverty and injustice directly, which was imposed on Iranian society by corrupted ruling class, corrupt clerics and their foreign masters. He had to work hard at a very young age to support his mother and himself and that provided him with opportunity to see all the problems in society and experience them directly. During those years, children education was a luxury which was available only to a small portion of society which had all the means of prosperity in their monopoly while majority of Iranians lived a very poor life. This matter in fact became an important element in Reza Shah's plans once he had the opportunity to do something about it when in the position of leadership. Reza's career in the Persian Cossack Brigade which was organized and run by Russians at that time was result of a lucky incident along his fascination with the marching and ceremonies that this military group carried every day in their barracks. Cossack's barracks was on the path which Reza walked all the time to do his business. He enjoyed watching the performance of organized uniformed Cossacks every day. As a strong and tall teenager, Reza drew the attention of a Cossack�s commander who noticed his interest while watching the ceremony and was asked by the commander if he was interested to join. Reza accepted immediately and started his long journey to change the destiny of his nation by freeing them from the hands of corrupt ruling leaders and putting the nation on the path of modernity and progress. It is true that Reza Khan's ascending to the position of Cossack's leadership after Russians revolution (which resulted in abandoning Cossacks) was with assistance and advice of a British officer named General Ironside whose mission was to find a strong military man to lead the Cossack Brigade. This was in fact to avoid chaos that might have affected the stability of Iran while British were not able to deal with that situation directly, but this matter in no way means that he was bound to follow the agenda of British in Iran. Even some of those who considered Reza Shah as their own enemy could not deny this. Reza Khan (as he was known by that time) was a very intelligent person who had realized the terrible situation that his country was in, and took advantage of the opportunity to put his own agenda to work in order to free his nation from dependency to foreigners (British and Russians in particular) as he continued to expand his control over different elements of power and affairs of the nation. Reforming the nation with a backward and corrupt system and culture and dragging it into a modern age in a short period of time was an extremely hard task. The material that was available to Reza Khan was none other than remnants of Qajars aristocracy and an extremely poor nation which was ridden with disease and suppressed under local greedy and ruthless rulers who cared for nothing other than holding their own power over miserable people at any price. Later on, when he had become the Shah of Iran, someone told him that he had to either use Qajars statesmen and accept all the consequences of it (which meant continuing injustice and corruption) or start making his own statesmen by training new groups of people. This was an important task and in order to accomplish that, Reza Shah initiated a program to send some of Iranian students to European countries (France in particular) at the expense of government to get trained as new statesmen and experts to run the country for betterment of the nation. Among the first group of students, we see some familiar names like Mehdi Bazargan (who became the first PM after Islamic revolution) and Dr. Taghi Arani who established the first communist movement in Iran that later became Tudeh party. Undoubtedly, most of these people believed that they were serving Iranian people while they were in fact working against the interests of their own nation after getting the education that was intended to make them better statesmen for their country. There were many others who went the same route and some of them even found the opportunity to hold important positions within the system that they helped to break later. In those days, it was the hardest thing for any leader in Iran, to find the people who could be trusted with any kind of work. Majority of people were poor, illiterate and ignorant and a big portion of limited number of educated people in Iranian society took pride in serving the interest of foreigners rather than their own or were after their own fantasies to save the nation by resorting to unrealistic and impractical ideologies and philosophies. It was under such conditions that Reza Khan had to implement his nationalistic agendas and revive the spirit of nationalism and pride in the heart of Iranians and put the nation on the path of progress and modernization with the help of those who were willing and capable of helping. He took advantage of weakness of Russian and British governments after the war to put his agenda to work and prepare the nation to enter the age of modernity through establishment of unquestionable authority for central Iranian government by suppressing the local rulers who dreamed of disintegrating the nation with the help of British or Russians. Many decades of weak and corrupt governments during Qajars had resulted in loss of big portions of Iranian territory in the north, east and south and Iran was on the verge of further disintegration from north and the south with the help of foreign agents. At this stage of his work, Reza Khan had assistance of some of nationalist Iranian army officers to impose the authority of central government throughout the nation and from those, name of Fazlollah Zahedi as a major army commander who later played another important role in another sensitive part of Iranian history, should be mentioned. "At the very bottom of the depression, Shah Reza Pahlavi of Persia became infuriated at discovery that, as an observer put it, "oil is not gold in these days." The Shah's country had become an oil state; petroleum royalties from Anglo-Persian provided two-third of its export earnings and a substantial part of government revenues. But, with the Depression, the royalties from Anglo-Persian plummeted to the lowest since 1917. Appalled and outraged, the Shah blamed the company, and he decided to take matters in his own hands. At a Cabinet meeting on November 16, 1932, to surprise of his ministers, he abruptly announced that he was unilaterally canceling Anglo-Persian's concession. It was the thunderbolt that no one had really believed that Shah would dare deliver. His action threatened the very existence of Anglo-Persian." Reza Shah threw D'Arcy's contract in the fireplace out of frustration and declared it canceled when leader of Iranian negotiating team told him the contract is not negotiable! Some time earlier, in a private meeting with an educated Iranian who had criticized his decision regarding an issue, Reza Shah had told him that he was only a soldier of the nation and needed help of educated and expert people like him to come forward and provide ideas, directions and advice for better outcome of any plan so he could push to implement them. He even participated in manual labor work during construction of a road side by side with other workers to show that he would do anything to help in reconstructing the country. But in the case of oil, nobody seemed to be able to help and no other valuable resources were available to support development projects so Reza Shah decided to nullify the D'Arcy's contract altogether to force the Anglo-Iranian Oil Company into negotiation and it worked. It's worth mentioning here that nationalization of oil industry was once discussed during this period and was rejected by parliament in a realistic move as Iran did not have the skilled manpower and the resources for operating such industries at that time. Late Dr. Mosadegh who was an MP from Tehran and later in 1950's became champion of oil nationalization voted against it (and rightfully so) at that time. One of the events which happened in the same period that Iranian government was struggling to get a better share of revenue from its oil industry was discovery of a plot to topple Reza Shah. At the top of this plot, a high ranking Qajar aristocrat, Firouz Mirza Nosrat o-dowleh, who continued to hold important government positions while still dreaming of restoring Qajar dynasty with himself at the top. Nosrat o-Dowleh along with a few others were arrested and put in jail. This matter had a negative effect on Reza Shah's trust towards his Court Minister, Abdolhossein Teymourtash, whom he consulted on every matter including oil related discussions. Teymourtash, according to writings of some of Iranian and foreign diplomats who knew him closely, had a lot of influence on Reza Shah at some point as he was the only person who had direct contact with the Shah. This matter had become a reason for jealousy of many who despised him for his power and influence. Some people accused him of taking advantage of his position and influence in financial institution (which he worked with at some point) to gather wealth and support his gambling habits. According to some stories, his womanizing habits resulted in becoming a victim of British espionage activities and losing a briefcase full of documents regarding his secret communications and relations with Soviet officials which ended up in Times of London to intensify suspicion towards him. This event happened when Teymourtash made a stop in Moscow to talk to Soviets on his return from London to Tehran. He was on a mission to convince the British to enter negotiation for a new contract with Iranian government over oil but failed to gain anything from that visit. Another story claims that a Russian who defected to Iran provided some information about Teymourtash being a spy for Soviet Union. Mr. Hassan Taghizadeh who later signed the new oil contract with British; has claimed that Teymourtash was innocent and what happened to him was unfair. But according to some reports, family of Teymourtash consider Taghizadeh the reason for his imprisonment and death in prison. As we can see from this little story, backstabbing, suspicions, espionage, betrayals, trickery and intrigues from every side had made Iranian political environment so intense and so complicated in those days that it was impossible to reach a solid and clear conclusion on any matter with confidence. This was a common issue regarding anything in the politics of Iran which suffered from poisonous relations that existed in our country because of corrupt aristocratic system and influence and propagandas of greedy colonial powers. The conflict with Anglo-Iranian Oil Company was not settled easily and British side decided to take the matter to Permanent Court of International Justice which Iranian government refused to accept its competence and therefore the matter was taken before the Security Council in the League of Nations. At this time, British accepted to enter talks with Iran for a new concession after the League of Nations advised both parties to go back to negotiating table. Resulting contract after over a year of bargaining by both sides, provided Iranian government with much bigger share from oil while completely canceling the exclusive right of oil transportation for British side (which was very important from Iran's point of view) and reducing the geographical area of the concession that covered about 85% of the whole country earlier, but extending the period of contract which could not be terminated till 1979 after later changes. According to some stories, this matter was brought into discussion in the last days of negotiation by Anglo-Persian Oil Company. Seyed Hassan Taghizadeh was the leader of Iranian negotiating team, who came from a religious background (his father was a mullah named Seyed Taghi) and himself was a mullah during younger age. He later turned into a secular politician and his activities and roles in politics of Iran during Constitutional Revolution and after that was well known to many Iranians. The issue of extending the oil contract was later questioned by some of the members of parliament in an inquiry session from Mr. Taghizadeh, who led the negotiating team for Iran. When he was asked why he agreed with extension of the contract, he blamed Reza Shah indirectly (after Reza Shah's abdication) and claimed that he was afraid for his life if he did not. Regarding the oil dispute with British, Mr. Ismail Raeen in his book "Freemasonry in Iran" says that British had brought their Navy and other military forces around southern Iranian ports of Abadan and Bushehr to influence the outcome of negotiation at that time. British government which had switched all of its naval ships from burning coal to more efficient oil-based fuel in 1914, and had been tied to Iranian oil, was the main shareholder of Anglo-Persian Oil Company and intended to show to Iranians that she was serious in protecting her interests at any price. Disputes between Iranian government and British over oil, although resolved in principles for the time being but continued over many other details. In the year 1941 presence of a group of German citizens became an excuse for Allies to attack Iran by accusing Iranian government of collaboration with Germans. After the WW I had ended, Germany which was driven out of world's oil market entered into an agreement with Iran to get one million barrel of oil in exchange for construction of two sulfur plants in Masjed Soleyman. In fact, some experts assert that oil was a major reason for Hitler to go to war as Germany was in serious need of oil to follow its industrial development projects. Shortly after Allies invasion of Iran, Reza Shah was forced to abdicate when British positioned their forces near the Capital and threatened that they would attack Tehran if he did not resign. During the days of the few weeks after Invasion of Iran by Anglo-Soviet forces, Reza Shah was target of worst attacks by British propaganda machine. They accused Reza Shah of being a despot and repressive ruler. In one occasion when the price of bread soared because most of the food was taken by occupying forces and created a near famine state in the country, Reza Shah interfered and ordered to reduce the price by 50%. This matter became a subject of negative propaganda by BBC which accused Reza Shah of forcing the poor bakers to pay the difference while in fact; it was Iranian government that subsidized the price of wheat and bread. The amount of false and negative propaganda by British and their supporters in politics of Iran against Reza Shah was so overwhelming that even some of true supporters of Reza Shah like Ali Dashti had turned against him. This matter had effectively disabled any reaction from the public in support of deposed Shah while most of Iranian people were watching as events unfolded, just like impartial bystanders. Daniel Yergin in his book attributes the rise of opposition to Reza Shah after his abdication to his distrustful treatment of even faithful supporters as he was suspicious of everyone. Knowing the history and background of deep corruption which had taken over the elite and higher classes of Iranian society have been definitely a major factor in this regard that Mr. Yergin could not have in dept information about. He mentions that Reza Shah once told a visitor that Iranians were "bigoted and ignorant" and considered Anglo-Iranian Oil Company something like mullahs, an element of power within power, and he was determined to reduce the power and influence of both. "Reza Shah's ouster was greeted with relief: no more police state, no more arbitrary self-aggrandizement on the part of Crown. We celebrated his fall, quickly forgetting that the most important human right is to live under a government strong enough to maintain law and order-- and that he had delivered such a government. Even the worst tyranny is better than no government at all, since nothing causes human beings so much misery as anarchy. Yet anarchy is what we were in the midst of as we hailed the new king, enthroned by Great Powers as they squatted on our land, while turning our faces from the man who had brought a modicum of cohesion to our country and relief from outside predators." Mr. Famanfarmaian also mentions in his book that the British ambassador, Reader Bullard, was not happy about replacing Reza Shah with the Crown Prince and was in favor of either a Qajar king or a different member of Pahlavi family. Apparently, he even offered the throne of Iran to a Qajar prince known as Sarameh-doleh which he refused. 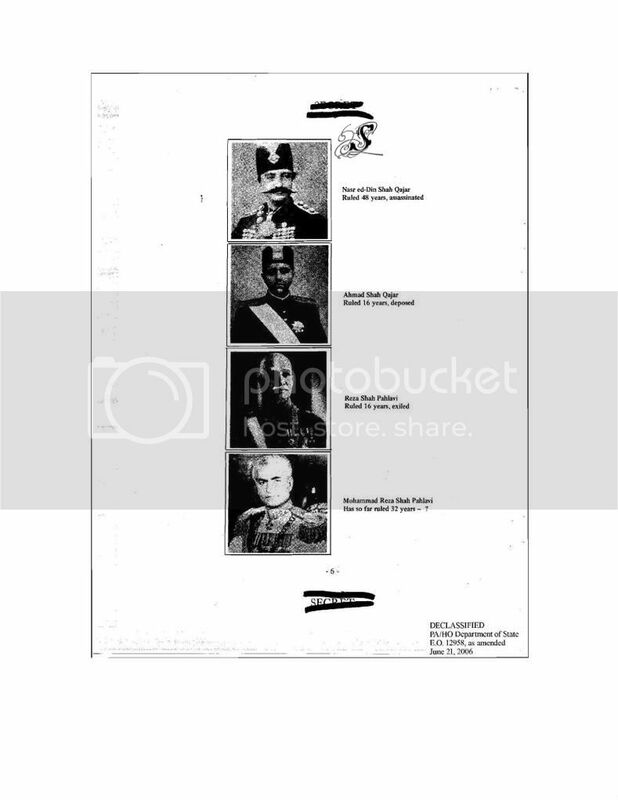 According to memoirs of Prince Hamid Mirza Qajar who later joined British Navy with the name of David Drumond, the British plan was to install him as King of Persia but this plan did not go through after they realized that Mr. Foroughi had taken the Crown Prince of Reza Shah to the parliament to take the oath of office as the king of Iran. Reading through these lines might help us understand to some degree that what kind of situation Iran had at that time and how close it was to total colonization by British empire which its ambassador allowed himself to intervene in decision making about who should be at the top of the government system in that country even though Iran had a constitution and a parliament and a Crown Prince to keep things in order. It is obvious that the issue of oil in Iran and dispute over that with British government as the main shareholder was not going to go away easily. This matter continued to affect the politics in Iran and the relations with oil consortium and British government for a very long time. Later on, US government and oil companies which were reluctant earlier to venture into Iranian oil exploration business in the eastern region of the country, were dragged into this story as partners to make things even more complicated. This matter continued throughout the rest of previous century and as we shall see, left its deep marks not only in the politics of Iran but also in the region and possibly the whole world. Mr. Farmanfarmian who worked in ministry of finance at some point, has brought a little story in his book about a meeting with a couple of American "oil consultants" in 1944 who were invited by Prime Minister Sa'ed at that time to bring Americans into oil equation in order to change the situation and take away British monopoly on Iranian oil by giving a new concession to Americans in the north region of the country. These two Americans were Herbert Hoover Jr. and A.A. Curtice who were both involved in negotiation between American oil company (mainly Standard Oil which belonged to Rockefellers) and Mexican government in their dispute during late 1920's. The first 50-50 contract in the oil business was signed with Mexican government at that time which settled the dispute to the satisfactory of both sides and started a new trend that was later applied to the oil concessions in other areas where Americans were involved. British however, were not happy about 50-50 contracts and had no intention to follow American model until they ran into serious problems and confrontations with Iranians. Mr. Farmanfarmaian says that he told Hoover (the American oil consultant) about dominance of British in the oil business in Persian Gulf region which, as he believed, would drive Americans out of the area but Hoover laughed at him and said that he was overestimating British power. Then Hoover told him that British would have no choice but to share the oil in future which sounded very unbelievable to him. He later shared this information with his cousin, Dr. Mohammad Mosadeq who was an MP from Tehran at that time who expressed his deep appreciation in exchange. From the comments made by Mr. Farmanfarmaian in this regard and also in other parts of his book, it seems very likely that himself has been at least very sympathetic towards British at that point which was not uncharacteristic from a Qajar aristocrat. In some other parts of the book, he mentions another story about his meeting with American representative to complain about the Iranian election fraud which had cost him his seat in the parliament. This indicates that how the typical Iranian politicians were after resolving their problems by resorting to relations with foreign elements and centers of power because otherwise what could be the point of such discussion? This matter was very common in Iran especially in those days that Iran had turned into playground of all major powers of the world. A new trend was unfolding in the political arena of Iran as a new power was expanding its involvement in the political games of this country. Soon after discussions with American consultants, Iranian communist party of Tudeh organized a massive demonstration in which they shouted "death to Sa'ed" and demanded the oil concession to be given to Soviet Union! Interestingly enough, many units of Soviet Red Army soldiers and armored vehicles and tanks were present in this demonstration alongside with Tudeh party which they could never deny it but tried to downplay that by attributing the presence of Red Army to October Revolution celebration. Some of Tudeh members who have published their memoirs later claimed that Red Army's appearing in that event was unexpected and Tudeh party leaders were not aware of that. Iraj Eskanadri who was a prominent member and later became the party leader, has complained (decades after the fact) about Red Army and Soviets demands in that event which had a huge negative effect on the image of the party. Tudeh party has always tried to present itself as defender of Iranian people's rights but turned out to be a tool in the hands of Iran's enemies to put pressure on Iranian government. In this way, an attempt by PM Sa'ed which was supposed to be carried out secretly in order to keep the British and Soviets of meddling in that affair, was brought to an end with a fiasco without producing any result. The news had somehow leaked to Soviets and Tudeh party in which Maryam Firouz (Mr. Farmanfarmaian's sister) was among its leaders. Now that I mentioned about two members of Farmanfarmaian family, I have to add here that Abdol-Hossein Mirza Farmanfarma (father of Mr. Manouchehr Farmanfarmaian), who had a total of 36 children from his 8 wives, was a known Anglophile. He was considered a friend by Percy Sykes who headed South Persia Riffles army that was established by British to control southern regions of Iran. Farman-Farma had been awarded the Order of St Michael and St George by British for his services and held many different government positions in the south and west parts of the country. He was governor of Fars province when Reza Shah took his troops to Tehran. He was later replaced by his nephew, Dr. Mohammad Mosadeq and was called to Tehran by Reza Khan to be imprisoned upon his arrival along with his son, Nosrat ol-doleh (father of Mozzafar Firouz who played a revengeful part against Pahlavis throughout his political career). Firouz Mirza Nosrat ol-Doleh whose mother was daughter of Mozzafar ol-Din Shah, was minister of foreign affairs of Ahmad Shah and the prime candidate to become the next Qajar king after him. Nosrat ol-Doleh and his sister Maryam later chose the name of their grandfather, Firouz, as their surname. This was a very brief summary of what founded and shaped the political relations of Iran (internally and externally) during the decades after the WW II which I will discuss in next part and that will include some of original and true intelligence reports and documents that despite wide circulation of falsified and fictional stories, have somehow escaped the attention of mainstream media and propaganda systems to mislead the public about the truth and hidden agendas of interested powers. Before getting to the core of problems during the era after WW II until the events of Islamic Revolution in 1979, we need to have a quick look at one of the most extra ordinary and magnificent documents which has shed light on many of dark and obscure corners of the history of our nation in modern times. This document is called "Freemasonry in Iran" authored by Esmail Raeen whose life was taken because of that as he predicted when he started preparing it over 20 years earlier. Mr. Raeen has done extensive research and gathered a lot of original documents regarding the affairs that Freemasons have been involved in our country. During his research, he was threatened multiple times. He was once even imprisoned with false accusations under influence of some Freemasons who had infiltrated every organization of the nation, but later another freemason released him from prison! He says it was right after that which he could access a lot of information and documents to prove his suspicion of evil intentions and actions of Freemasons towards our nation. Mr. Raeen has met many Iranian Freemasons from whom some were openly admitting to being a Freemason and proud of it too! According to Mr. Raeen, there are some honest, dignified and patriotic people among Iranian Freemasons but there are also others who are evil and greedy and think of nothing other than gathering wealth in corrupt ways and serving the agenda of their alien masters. He believes that it is possible that many Iranians who joined freemason did so with clean and honest intentions because they were deceived by the messages of freedom, brotherhood and equality from this fraternity but later found themselves trapped in undesirable situations with traitors and foreigners. Dr. Mohammad Mosadegh might have been one example of such case that Mr. Raeen talks about. He briefly joined Adamiyat Society which apparently promoted cause of democracy before the events that ended up with Constitutional Revolution but later started working with "majma'e ensaniyat" (humanity society) which was held in Mostofi-Ashtiyani's house. A document was later released by Fereydun Adamiyat (son of Hussein-Qoli the founder of Adamiyat Society) which apparently shows the handwriting of Dr. Mossadegh taking the oath of loyalty to the cause of Adamiyat Society that according to some interpretations was the Constitutional Revolution and dignity of human being. It is unclear why Adamiyat Society should have taken such measures in getting a written oath of loyalty from its members and what has been the purpose of secrecy in their activities. Some people believe that taking the oath of loyalty was in accord with Masonic traditions which Adamiyat Society representing. According to Mr. Raeen, Freemasonry lodges in Iran have been linked with different Masonic grand lodges of different countries that included England, France, Germany, USA, Switzerland etc... The lodges with links to England and USA were more popular and more influential than others among Iranians. Many Iranian politicians of all ranks had membership in different lodges of Freemasonry. Mr. Raeen mentions that after events of WW II and invasion of Iran, only a few of the Iran's Prime Ministers WERE NOT Freemasons which included: Ali Razmara, Asadollah Alam, Ali Amini, Abdolhossin Hajhir and Fazlollah Zahedi. He also states in his well researched book that except for Reza Khan whose control over military might have helped him to survive and implement his nationalist agenda, all other Prime Ministers who were not Freemasons during previous 150 years, were either killed or pushed out of political power by them. Mr. Raeen has written in some details that how Freemasonry started in Iran and mentions name of Sir Gore Ouseley as the first Freemason who entered most of Iranians of the royal court of Qajari Shah and many other high ranking Iranian aristocrats in Freemasons fraternity which included the Prime Minister at that time. Ouseley who held a high status among British Freemasons, believed that Iranian society was "wild and barbaric" and suggested to British foreign minister that keeping them in that state would help British to protect their interests in India through creation of continuous chaos and weakening of Iranian central government. He helped preparation of defeat of Abbas Mirza of Qajar in his battle against Russians by passing the secrets of military plans and arrangement of his forces to Russians which was in accordance with the policies of keeping Iranian government weak and miserable. Later, after the war, he represented the Qajar King to negotiate the treaties that broke up major areas of northern Iranian territories from the mainland. He did all of this with the help of Iranian Freemasons in the royal court and around the Qajar Shah from whom Abolhassan Ilchi had bigger role. Ouseley was later awarded with one of highest medals of honor by Russian Tsar (probably another Freemason brother). From that point Freemasonry has always played its destructive role in the affairs of our nation and Freemasons were despised by some of Iranian people who noticed their evil deeds while a good portion of Iranian elite, for different reasons, continued to work with them against the interests of the nation. The activities of Freemasons were driven into obscurity during the reign of Reza Shah but even at that time, many of most active Iranian politicians in the system and others who were involved in different affairs of the nation were secretly linked with that fraternity. Mr. Foroughi and Mr. Taghizadeh are just two of many well known names. Others include: Mr. Jafar Sharif-Emami, Mr. Mahmoud Djam, Mr. Mohammad-Taghi Eskandani, Mr. Zaryab Kho'ee (Abbas), Mr. Yarshater (Ehsan), Mr. Zarinkub (Abdulhossein), Mr. Safa (Zabihollah), Entezam (Abdullah and Asdollah) and many others who were all involved with political, economical and cultural affairs of the nation in one way or another. Mr. Tolou-ee in his book "Pedar va Pesar" (Father and Son) has raised the possibility of Mr. Foroughi having a hand in removal of Reza Shah through British. Apparently, other than personal grievances of Mr. Foroughi against Reza Shah because of previous maltreatment, he had also complained to British Ambassador about Reza Shah's treatment of his high ranking government officials during the same time that occupying forces were present in Iran. There are some hints in the writings of Reader Bullard (British Ambassador) and Winston Churchill which show the decision to force Reza Shah to abdicate had not been taken before invasion of Iran. Reader Bullard in his memoirs about the invasion and forcing Reza Shah out of power says that, most of Iranians were in favor of removal of Shah but we had no intention of doing that as long as transportation of goods and military supplies to Russia through Iran would continue without any problem. He has not mentioned where did he obtained that information from and who those Iranians were but it would be reasonable to think that he received such feedback from those who were in close contact with him and Mr. Foroughi with much feelings of resentment (because of previous ill treatments) towards Reza Shah was one of them. He states that we (the invaders) did not want to get into internal affairs of Iranians but Iranian people were not happy about that because they believed Reza Shah was installed and supported by British and wanted to get rid of him. This matter apparently became the foundation for spreading of lies and accusations against Reza Shah through BBC Farsi program which had started to work just for such purpose during the beginning days of occupation of Iran. BBC's reports were prepared and sent to London from British Embassy in Tehran by a staff named Ms. Lambton to reflect most current events in Iran and provoke the society against Reza Shah. Winston Churchill has written in his memoirs about why it was necessary for British to use Iran in order to help Soviet Russians while keeping the hands of Germans from Iranian oil. British had discussed this matter with the Soviets about three months before the invasion which they agreed but their condition was to do it in joint operation. There was no mention of anything regarding Reza Shah at that time and the decision in that regard was probably taken later when British and Russian troops were in Iran. All available evidences from British communication documents show that presence of a few hundreds of German citizens in Iran was just an excuse and no matter what Iranian government would do, the invasion was inevitable. Reza Shah wrote a letter about this matter to American President after the invasion and asked for his help to protect the integrity of Iranian territory. According to Assadollah Entezam in his memoirs, American ambassador agreed with Reza Shah's viewpoints regarding the invasion by British and Soviet forces in a private meeting in which, Reza Shah verbally expressed his appreciation in response to President Roosevelt's letter and his support of Iran's territorial integrity. After this short review of some of the issues that influenced later current of events in the country, we get to the era of Mohammad Reza Shah Pahlavi in Iran. Mohammad Reza Shah started his reign on a very bumpy road from the beginning at the age of 22 after his father Reza Shah was forced to resign by British occupying forces. Most of the world was in the state of war and Iran was under occupation of old enemies with no real means to resist their demands and stop their mad behaviors towards the resources of the country and its people. Iranian government had no real power to deal with issues created by occupiers. Iranian politicians were mostly suspected of having links with British or Soviets, and Americans had also entered a new phase in relations with Iran to make things more complicated than before. While Soviets tried to influence the affairs of Iran through Tudeh party, British were doing the same through more obscure methods with the help of Anglophile politicians and clergies who had a long lasting relation with them. Americans, a nation founded by Freemasons, would definitely see better possibilities for themselves in future of Iran, as foreseen by Mr. Hoover. One of the major issues which faced Iranian government during occupation was to reach any kind of negotiation or contract with any of the invaders to accomplish anything for betterment of the nation. This matter could easily cause a lot of problems for the Iranian government as seen in the case of northern oil discussion with Americans. Another issue was that during those times, Soviet Union had taken advantage of the opportunity to start the process of secession of northern and western portions of Iranian territories by installing and supporting a group of their own puppets as local governments. This matter was carried out with the help of Tudeh party and its military organization which was formed secretly inside Iranian army. Military organization of Tudeh party, against all norms in any army in the free world (which requires army to be free of association with any political party), was formed by the followers of Tudeh party within high ranking officers of Iranian army and became an element of real threat to stability and integrity of the nation. According to some stories, another group of officers in the army had organized themselves as nationalist military organization around the same time and had links with National Front. Lack of enough control by Iranian government over the affairs of military and misconceptions of leaders of the country about democracy had resulted in a near chaos situation in the army which was built through a painstaking process and a lot of hard work during the reign of Reza Shah. All the works which were previously carried out during the era of Reza Shah were brought under scrutiny and in many cases criticized and condemned by old and new opposition. From building of the railways and roads to organizing the military, to expansion of education and dispatch of Iranian students to Europe and everything else was condemned by opposition who apparently believed all those work was done against the interests of Iranian people! The amount of nonsense which was put forward by the opposition that was mostly encouraged by limitless freedom (without any sense of responsibility) and motivated by presence of foreign powers that openly meddled in the affairs of the nation; was beyond sanity. The behaviors of Iranian elite in that chaotic situation justified the policies which were suggested by Gore Ouseley about 150 years earlier. Vulgarity and lompanism was the order of the day, as it is in the politics of Iran of today since 1979. Soon after end of WW II, Iranian government faced one of the most serious challenges and threats to its integrity by occupying forces of Soviet Union which refused to leave while demanding for the oil concession in the northern region of Iran. Tudeh party was 100% behind Soviets demands in this regard and they even dispatched a group of the officers from their military organization to assist in organizing an army for so called democratic republic of Azarbaijan which was declared by Jafar Pishevary with support of Soviets. This was done in order to put Iranian government under pressure and even take away Azarbaijan from Iran if possible. Prime Minister of Iran was Qavam o-Saltaneh at that time. Qavam was known as a seasoned politician from Qajar era. He was the author of the letter which was signed by Mozzafar o-Din Shah to accept the Constitutional Revolution of Iran. That letter was presented to the Shah by his older brother Vosougholdoleh who was Prime Minister of Mozzafar o-Din Shah at the time. Vosougholdoleh is well known in the Iranian history for his disgraceful agreement of 1919 with British government after accepting bribe from them. Ahmad Qavam, unlike his brother, was considered a strong and patriotic politician with a good amount of political and negotiating skills in his bag. About 25 years earlier, he had been once arrested and imprisoned by Seyed Zia who was later removed of power and sent to exile by Reza Khan and then Qavam moved from Prison to the position of Prime Minister to replace him. With such background, Qavam ol-Saltaneh turned out to be a great choice to lead Iranian government during Azarbaijan crisis. One of the shiniest points in the report card of Dr. Mohammad Mossadegh during those days was, passing of a bill in the Iranian parliament which was attributed to him and would prohibit the government of Iran from signing any agreement with any of invading powers while their troops were still in Iran. This became a good tool in the hands of Qavam to refuse granting an oil concession to Soviet Union in Northern provinces of Iran. He promised Soviets (after meeting Stalin) that when the Soviet's troops left Azarbaijan then the oil concession would be presented to the new parliament for their approval according to the law which did not permit Iranian government to make such concessions before foreign troops leave the country. Soviets had no choice but to either leave or face an international crisis so the left. This matter created an opportunity for Iranian army to move to Azarbaijan under command of General Ali Razmara and remove the puppet government from power. Jafar Pishevari and some of his friends and army left Azarbaijan for Russia by crossing northern borders. As part of the same operation, General Fazlollah Zahedi moved the units under his command to the west to disperse Kurdistan Democratic Sect and drive them out of Iranian borders to the west. According to some accounts, there were parallel activities from other routes in convincing Soviets to leave Iranian territories from which the meeting of Princess Ashraf Pahlavi (twin sister of Mohammad Reza Shah Pahlavi) with Stalin and also negotiation of US representative with Russians to respect Iranian territorial integrity (as promised by US President Roosevelt to Reza Shah) need to be mentioned. Tudeh party which had expanded its influence and operations throughout the country by taking advantage of democratic atmosphere of the country, had found a good foothold among working class especially Iranian oil workers in southern province of Khuzestan. Oil, once again became a hot topic in the politics of Iran. Americans who had a long term plan to enter the oil business activities in Iran and had failed the first attempt due to meddling of Tudeh Party and Soviets during Prime Minister Sa'ed, did not intend to let others get away with sweet deals that they were getting from Iranians without sharing it with them. Many among Iranian elite had developed friendly sentiments towards Americans as they believed that, because of their historical conflicts with British over their independence, Americans would be supportive and reliable ally for Iranians who shared some views with them regarding meddling of British in their own affairs. In fact, Americans were considered benevolent liberators in the view of many Iranians (probably even today) who would help other nations in eliminating influence of old and evil colonial powers. Whether this view was correct or not, is debatable but the truth is that, foundation of the United States of America was put in place by some powerful Freemason figures who followed their own globalist agendas and this was the same fraternity which had influenced the politics of Iran at least since a couple of centuries ago and it might have not been very realistic to think that they would be much different than their European Mason brothers like Gore Ouseley. The roles and influence that Tudeh party had in one of the most crucial periods of Iran's history and the links that it had with both (Russian and British) colonial powers and also to the deposed dynasty of Qajar, is so significant that requires much more attention and study to reach some real understanding and logical conclusions about this party and its effects on the current affairs in Iran. Tudeh party was successful in gaining support among some newly arrived intellectuals and working class through popular slogans. They talked about the issues which were pleasant to the ears of the portions of society that had no share in ruling power and felt to be left out. Leaders of Tudeh party were mostly coming from aristocrat families or had links with high ranking clerics with a lot of grievances and complaints towards the system which was established by Reza Shah. Nouredin Kianouri who climbed to the position of party leader in 1979, was the grandson of Sheikh Fazlollah Nouri, one of the famous Clerics of his time with proven ties to British. Sheikh Fazlollah whose opposition to Constitutional Revolution in favor of a version of religious ruling system (Velayat Faghih) became the foundation for establishment of Islamic Republic in Iran, was later tried and executed as a traitor to the nation. Nouredin married Maryam Firuz, sister of Firuz Mirza Nosrat ol-Doleh whose death during house arrest was blamed on Reza Shah by his family. According to some stories, after Reza Shah abdicated, a case against someone named Dr. Ahmadi was brought to the court of justice regarding this matter and based on complaint by Nosratol Dowleh's son, Mozzafar Firuz. The result was conviction of Dr. Ahmadi. Maryam Firuz in her memoirs about what brought her to join Tudeh Party mentions two reasons: "the suffering of my father under Pahlavi's reign which I witnessed with my own eyes and the suppression of woman's rights" and then she adds: "I will never forget when my father desperately said if there would be anyone to revolt against the Shah and take his revenge of him?". She says that in those days everyone was on the Shah's side and the only group who fought Shah was Tudeh Party so she joined them. Maryam Firuz admits that she never studied Communism theories even though she was an important member of central committee of the party and believed that there was no need for such knowledge to join the communist party. In her view, if someone considered herself a human being, if she loved her country and her nation, she would join Tudeh Party. About her first contact with Dr. Kianoury, she says that her father and her family were familiar with Sheikh Fazlollah Nouri and his family and loved and respected Sheikh Fazlollah very much so they knew each other through family ties. Reading through these lines, one may understand that how the menace of Qajar dynasty has continued to influence the affairs of our nation since over 200 years ago even after their removal from power. Going back to story of Tudeh party, we can not study this Iranian political group without knowing about Iraj Eskandari. Dr. Eskandari was among newly educated and trained students who came back from Europe when he was arrested along with Dr. Taghi Arani. Arani was one of the founders of communist movement in Iran along with some other people (total of 53 mentioned in previous part). According to Dr. Fereydun Keshavarz (another Tudeh Party member of the same group of 53) Eskandari was considered one of the most knowledgeable people of the group after Dr. Arani himself. After Reza Shah was removed from power, Eskandari and others were released. Shortly after that, the foundation of Tudeh Party was laid by Iraj Eskandari with the help and influence of his uncle, Soleyman Mirza Eskandari, and he became an important element within its leadership. He later climbed to the position of party leader and stayed in that position until 1979 that he was removed and replaced by Dr. Kianouri. His family was linked with Qajar royals (he was cousin of Maryam Firuz) and this matter had gained him the title of "red prince" by some communist friends. His uncle, Soleyman Mirza, was a member of Adamiyat Society (a cover name for Masonic lodge) founded by Mirza Hussein-Qoli Adamiyat. Iraj Eskandari, in his memoirs, has written in much details about everything related to Tudeh party after he left the party and took asylum in France. In order to understand Tudeh party better, Dr. Eskandari's memoirs is one of the best sources which allows us to have a look inside this party from the viewpoint of an important member and a leader who had been involved with the affairs of the party since the beginning. It is necessary to mention that Mr. Eskandari who is remembered by many of his comrades and friends as a true righteous person might have never written anything about realities of Tudeh Party for future generations (as himself put it) if the new leadership of the party would not try to smear his name through lies which they spread about him in the Islamic regime's media while in captivity. Dr. Eskandari has written about sectarianism policies within the party which promoted certain people and even certain families which put their own interests and agendas above the policies of the party. He writes about how the problems and divisions in the leadership of Tudeh Party caused its ineffective reactions to the events in 1953 (as per Tudeh party�s historical mission) while the ordinary members followed the leadership like a bunch sheep. He says that the issue of blind following of leaders had resulted in dictatorial behavior of certain elements within the leadership which finally resulted in putting the whole party under control of KGB. He claims that as a result of false reputation of some elements, unqualified characters took over the leadership which later turned into a tool to identify and persecute of freedom lovers by Islamic Republic regime. These matters along with sheep-like attitude of followers in worshiping certain characters within leadership finally resulted in disgraceful demise and total failure of the party. Mr. Eskandari explains how Tudeh Party turned into a subdivision of so called Democratic Sect of Azarbaijan (fergheh democrat azarbaijan) after forming a union with this entity during late 1950's and early 1960's. He blames Abdolsamad Kambakhsh (of Tudeh Party leadership) who was the main ally of Kianouri, for disclosing the secret group of 53 to the government and the arrest of Dr. Taghi Arani and because of that, he had proposed (in a party convention) expelling of him and his allies from the party. The differences were temporarily settled later with the help of Maraym Firuz until Dr. Kianouri tried to climb to party leadership by making a case against Kambakhsh (resulting in his dismissal) in late 1969- early1970. Dr. Eskandari says that he did not want to allow Kianouri in such position so he became party leader himself. Eskandari says that Kianouri never believed in Communism. He (Kianouri) was very weak against any source of power and was a real coward person despite pretending to be brave. According to Eskandari, Kianouri's specialty was in lies and conspiratorial activities in which he had developed very high skills. Changing camps and joining Khomeini apparently was not out of character of Kianouri according to Eskandari. He had once praised Reza Shah in his doctorate theses as a genius and it was only after defeat of Germans in Stalingrad (St. Petersburg) that he joined communist camp. Dr. Eskandari speaks about the passing of information about Iranian army to Soviet Union government by members of military organization through Tudeh Party which he disagreed about but could not do anything to stop it. He states that Tudeh Party in those times, was just a follower of agendas of Soviet Union and any time Soviet government was in good relations with Iranian government then Tudeh Party would stay silent. Eskandari atributes the appointment of Kianouri to party leadership and replacing him to the Soviets intelligence service, KGB which had gained full control over the party's central committee. According to him, Soviets had put the affairs of Iran and Tudeh Party in the hands of the KGB branch in Soviet Azarbaijan Republic where former members of so called "Azarbaijan Democratic Sect" stayed and worked with them. Eskandari says that Gholam-Yahya Daneshian who worked with KGB and was a close friend of Kianouri, personally made the proposal of dismissing Eskandari and appointment of Kianouri during the meeting of central committee in early months of 1979. 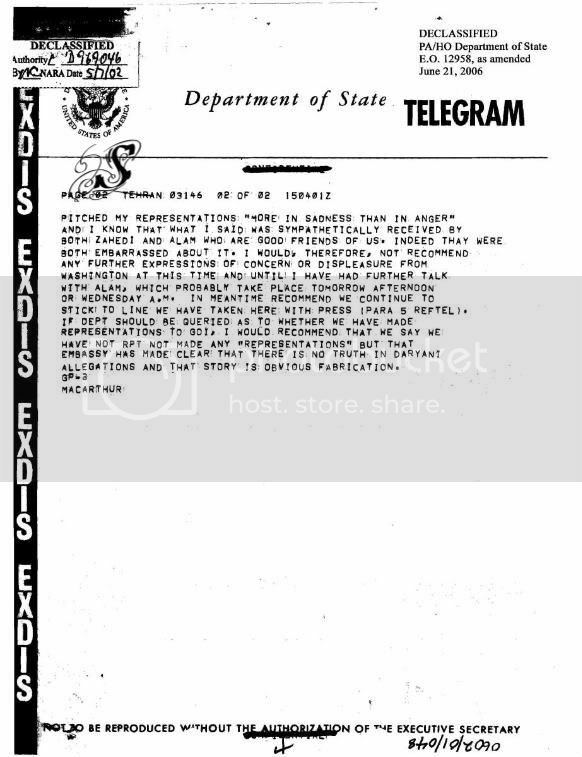 This, Eskandari says, happened after he rejected a suggestion (in 1978) made by someone from Soviet government who was neither related to Azarbaijan nor to the ministry of foreign affairs (probably a member of central KGB), to gather Iranian military personnel who lived as refugees in all Eastern Europe in order to make them ready for initiating a civil war in Iran so that Americans had to send their forces to interfere and thus, Soviets could move their forces into Iran too; like they did in Afghanistan. Eskandari also mentions that the original suggestion to give oil concession to Soviet Union came from Kianouri and was later promoted by Ehsan Tabari who used the term "Soviet domain" for northern region of the country in this regard. He says that himself (Eskandari) once used this silly term in presence of Dr. Mosadegh who pointed at him with his pencil sharpening knife and said to him that if he (Eskandari) talked about anyone's domain in that country one more time then he (Dr. Mosadegh) would personally cut his tongue with that knife! As we can see, decades after Qajar dynasty has been removed from ruling power in Iran, their legacy of corruption, servitude, lies and deception along with insatiable feeling of revenge from those who took away their undeserved privileges and luxuries continue to hurt our nation through the institutions and organizations that were founded mostly by the members of that family and their associates. The culture of attaching meaningless titles with ridiculous rights and privileges to the people with no real valuable qualifications, and also dependency to strangers and foreigners for petty materialistic gains and offering unconditional trust to them, had created such a poisonous environment in the politics of Iran that telling a friend from a foe was not an easy task if not impossible. Moreover, promotion of superstitious behaviors by Qajar kings and their dependent families and increasing power and role of clerics in the affairs of the nation through the royal court of Qajars had created a strong religious aristocracy within the system which spread its influence into the fabric of society that was comparable to (or even more powerful than) the influence of Zoroastrian clerics in Sassanid dynasty era. Unfortunately, this matter did not vanish after them either. The depth of corruption among elite and the extent of ignorance and illiteracy in Iranian society would not allow a speedy process to eliminate or even significantly reduce the negative effects of centuries of mismanagement by corrupt ruling powers and meddling of colonialists. While majority in society were struggling with all kinds of miseries, the elite were busy to make plans and take revenge against one another and when everything went wrong then they tried to justify their own wrong doings by invoking complicated ideological theories or blaming others for problems. The truth is that although patriotic Iranians were not scarce in those times but infiltration by enemies and plentiful of sellouts along with egocentric behaviors of many who were involved in the politics of the nation; had created a very bad combination which called for inevitable disaster. After WW II ended and all occupying forces left Iran, once again the issue of oil and its revenue came into focus and new negotiation started in order to advance the benefits of Iran from this natural resource by making amendments to the agreement that was made with AIOC during Reza Shah�s era. A supplemental agreement was reached between AIOC and Iranian government in 1949 that would provide Iran with 33 percent more royalties than 1933 agreement. This agreement was rejected by parliament for not addressing some major points including control over the price of oil sold inside the country and the rights for Iranian government to inspect AIOC�s financial books. Dr. Mosadegh and a group of his followers spoke up against the agreement and the discussion over this matter was dragged until the parliamentary period was over and the issue remained for next parliament to discuss after a new election. The next few years after this were the eventful years which resulted in one crisis after another and created deep divisions in our nation that were taken advantage of by enemies through manipulative propaganda and intelligence activities till this day. In the next part: the struggle over oil and promotion of falsified history about the events of 1950�s by Iran's enemies and those whose private agendas in self promotion would overshadow the Iranian national interests. In June 2009, President Barack Obama of the United States, in a speech which was directed at Islamic world and delivered in a visit to Cairo of Egypt, stated that: "In the middle of the Cold War, the United States played a role in the overthrow of a democratically elected Iranian government". 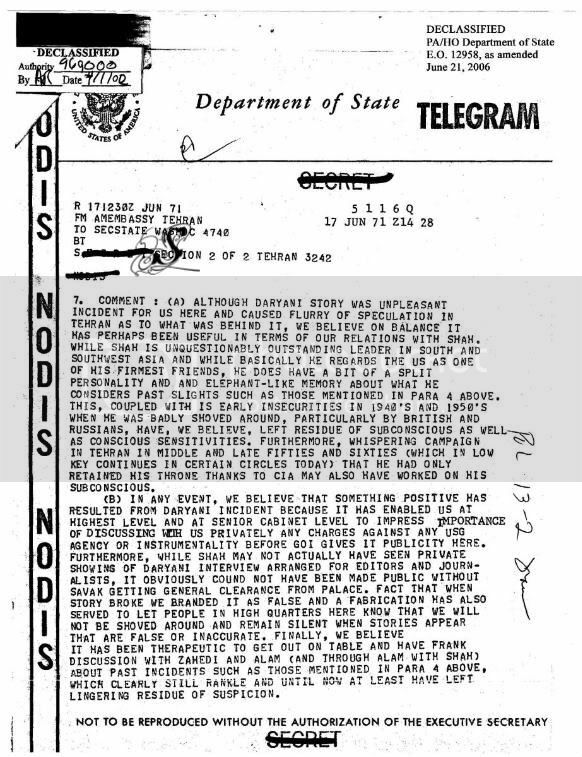 Vague statements like this by American officials at different occasions along with a document which has been produced by some fishy characters with claims to link it with Central Intelligence Agency of United States, are the roots of all stories that some people continue to make a business of them while adding fuel to the burning fire of political differences among Iranians. Irresponsible behavior of Iranian educated community to conduct a thorough and realistic research by evaluating all available documents that carry acceptable degree of reliability, and presenting a truly impartial analysis of the events without being influenced by predetermined conclusions and unfounded claims, has left the door open for manipulation and abuse of trust of Iranian society by some pseudo intellectuals and commercial writers in the interest of their own pockets and agendas. In the statements like the one mentioned above from President Obama, the implication is that a "government was democratically elected" in Iran at that time which means Iranian people were able to exercise their right to choose who they wanted to be governing their country. At the top of that government, was Dr. Mohammad Mossadegh who had support of majority of Iranians and was backed by a united front from many friendly Iranian politicians in and out of the parliament and enjoyed full support of the top figure in the system, the Shah himself. All of this leaves no doubt of presence of democracy in Iran which was exercised in full after Reza Shah had abdicated. Different governments came and went like in any other democratic society in the world up to that point. This democratic atmosphere provided new opportunities for rich and fat aristocrats of Qajar era who had lost many of their privileges and much of their influence over majority of Iranian society which was still in the state of peasantry with no real education. Presence of foreign troops in the beginning of this era had provided British and Soviet Union with great opportunities to establish new relations with elements of weak characters or no sense of patriotism for future meddling in the affairs of the country. These relations developed even further as time passed and eventually drove the nation towards dangerous instability through creation of an atmosphere of terror physical confrontations that casted fear and uncertainty over society. Constant demonstrations by rival groups with superficial and in most cases fake show of patriotism through displaying of extreme slogan banners and huge flags had made society a playground for mobs of ignorant followers of this or that political group that their strings were mostly pulled by rival members of different families from Qajar political lineage or the elements of religious aristocracy. Among these, an Islamic group that called themselves "Fadaiyan Islam" (devotees of Islam) and considered themselves followers of a mullah from 19th century called Seyyed Jamal-e-din Asadabadi (also known as al-Afghani). Seyyed Jamal is one of many controversial figures during Qajar era. He is known to have inspired the assassination of Naser al-Din Shah Qajar by Mirza Reza Kermani after Naser al-Din Shah lost interest in him and sent him to exile (to Ottoman Empire). Seyyed Jamal spent some time in Egypt and laid the foundation of a group that later became a model for establishment of a group that is known today as Ekhwan-ol-Moslemin (Islamic brotherhood) and was kicked out of Egypt for that. His was later completed by Hassan al-Banna and establishment of "Islamic Brotherhood". After leaving Egypt, he spent some time in Europe. In his trip to Europe, he was a guest of honor to a British lord in London for a few months before going back to Turkey. Seyyed Jamal has an interesting life story but the point here is not to talk about him but to have a brief look at the events related to the organization that is known to be founded based on his teachings; "Fadaiyan Islam" which played a significant role in shaping the political life in Iran since late 1940's. Fadaiyan Islam made their presence known by arranging demonstrations against different Iranian political figures that their leaders considered them to be against Islam. This matter had added one more reason for creation of crisis in the society and provided Tudeh Party with yet another unlikely ally in their activities against the establishment. Background of Fadaiyan Islam made it clear that a new ingredient was becoming a normal part of politics in Iran in order to eliminate those who were not acceptable by this fanatic religious group. Writing and shouting slogans against Monarchy was as common and acceptable as noisy demonstrations. Some journalists, who had sensed the political direction that society was moving under pressure from every side, wrote heated and hateful articles against the royal family which incited violence against the system. One of these journalists was Mohammad Masoud who tried to build a reputation as an anti Monarchy activist by writing accusatory articles against Pahlavi�s which were full of vulgarities. Mohammad Masoud was later assassinated and words quickly spread that Royal Court was behind it. There was no way to disprove that accusation and any attempt to deny it would make the matter even worse. Decades after murder of Mohammad Masoud, some information from former members of central committee of Tudeh Party came to light that showed the assassination of Masoud was ordered and carried out by Tudeh party through their "terror committee" which was headed by Kianouri. Dr. Fereydun Keshavarz and Iraj Eskandari have both admitted that this assassination was done to tarnish the support and reputation of Monarch among Iranians by blaming them for the crime. The rumors in this regard originated from Mozaffar Firuz who stayed in France at that time. Nouredin Kianouri later confirmed this information in his book. This event started a new trend in politics of Iran which brought Fadaiyan Islam closer to Tudeh Party that later used one of the members of that group for an attempt on the life of Mohammad Reza Shah in early months of 1949. Shah was attacked by someone named Nasser Fakhr-Arai who fired a few shots at him at a close range. There are different stories about the number of bullets that hit Shah which varies from 1 to 5 but in all reports it is clear that none of those shots caused a critical injury. Mohammad Reza Shah in his book "Mission for My Country� has written about that event that three bullets hit his military hat. One bullet went through his cheek and came out from under the nose and another bullet hit him in the shoulder. Fakhr-Arai was shot and killed on the spot by security officers and the role of Tudeh party and Kianouri became known to the government through investigation. Investigations also showed that Fakhr-Arai who had been armed with a pistol given to him by Kianouri, belonged to the group of Fadaiyan Islam which had murdered the great Iranian researcher and writer, Ahmad Kasravi just a few years earlier. As a consequence, Tudeh party was banned and some of its leaders were arrested. The Party was forced to continue its activities underground and under the guise of peace supporters and activists. This was around the same time that discussion over oil was continuing without getting anywhere. Other than Fakhr-Arai who was killed at the place of incident, none of Fadaiyan Islam was prosecuted in this case. The deadlock over oil had concentrated most of the attention of government and the parliament on this issue. Papers were reporting the parliamentary discussions everyday and the National Front members of the parliament and their allies under leadership of Dr. Mohammad Mosadegh were at the center of all these reports. Oil, was causing failure of governments one after another. In mid 1950, the government of Ali Mansour whose pro British position was known to all Iranians lost the confidence of parliament after a short period as Prime Minister and a well known high ranking military officer, General Haj Ali Razmara was suggested to replace him. Razmara was a highly intelligent officer with briliant military record from the time that he worked on the side of Reza Khan during suppression of the rebels of the republic that was formed in Northern Province of Gilan by Mirza Koochek Khan. Razmara started his government by introducing some reforms to decentralize the power and reduce the size of government. He fired many of government employees who were mostly useless and were in those positions because of their family ties. Razmara's reforms created a lot of enemies for him. Fadaiyan Islam and Ayatollah Kashani, who was Speaker of the House at that time, declared him "enemy of Islam" and made threats against him which meant he was in the same kind of danger as Ahmad Kasravi. He was also under constant attack by parliament members during discussions on oil contract with AIOC. A couple of days later Razmara was assassinated and the assassin was captured. According to some stories, Rzamara had the suggestion of AIOC for 50-50 contract in his pocket when he was killed. It became clear through court hearings that Fadaiyan Islam were behind the assassination and Ayatollah Kashani had provided the gun through a third party but Kashani denied all of that in the court (which was held later) and even denied that the person who was arrested (Khalil Tahmasebi) was killer of Razmara and claimed that the man was just trying to make himself a martyr for Islam and that's why he had taken the credit for assassination. Hossein Ala became Prime Minister after Razmara but failed to gain the confidence of Parliament and his government did not survive. Next came Mohammad Mosadegh whose popularity inside and outside the parliament for such position was more than any other Iranian politician at that time. Mosadegh was well known for his uncompromising positions against AIOC and his appointment to the position of Prime Minister was not welcomed by British but he had full support of the parliament and Mohammad Reza Shah behind him. Shortly afterward, the oil nationalization bill was passed in Iranian Parliament and British imposed a worldwide embargo on Iranian oil. It is obvious that the alliance between top figures in Iranian government system and the parliament for the oil issue was not good news to AIOC. Mosadegh received full authority from the parliament to move ahead with oil negotiation without parliamentary consent. As discussions continued with no result the authoritarian privileges of Prime Minister Mosadegh was renewed by parliament for another 6 months. British government was getting concerned about losing all its investments and in Iranian oil industry and enormous profit that they gained from it as a result of nationalization. They tried to divert the process by making different offers after they had failed to stop the parliament from passing the oil nationalization bill. All offers by AIOC were rejected and even the offers from American government (with more friendly attitude towards Iranian government) to settle the differences were dismissed. Dr. Mosadegh once told the American Ambassador, who was puzzled by stubborn behavior of Iranian government, that the matter in his view did not have anything to do with materialistic gains but it was all about the Iranian national pride which has been put down by British for so long. After that, it became clear for American government which favored Mosadegh at that time, that there would be no settlement between AIOC and Iran. This matter raised concerns about shortage of oil in the market because Iran was not able to export even a drop of oil at that time while the dispute with British continued. During those times, Dr. Mosadegh who had left the Parliament out of negotiation with AIOC, kept it busy with other issues which were part of his reform plans. He reduced the senate period to two years and also cut the budget for royal court and royal family. According to some accounts, tight budget had even forced the young monarch to sell some of his belongings and the pressure grew much worse until Mohammad Reza Shah decided to resign and leave the country. This matter created a strong reaction in the public who became aware of that and gathered around the residence of Shah to show their opposition and then the message came from Shah that he would stay. In the meantime, the parliament which was left in the dark by Mosadegh regarding oil negotiations (Mosadegh kept rejecting offers one after another without discussing with parliament), voted against Mosadegh's request to extend his authoritarian privileges for another year. This matter infuriated Dr. Mosadegh who labeled the parliament members as "agents of British" and stated that he would dissolve that parliament. This, in fact, was the same parliament which had installed Mohammad Mosadegh as Prime Minister. It was the same parliament that Mosadegh himself was part of it at some point and the same parliament that had granted him all his requests for authoritarian power. While Mosadegh enjoyed the company of advisors like Dr. Fatemi and Mozaffar Firuz who had the most influence on him, the alliance from different groups and national figures, which was formed around him for a national cause, fell apart. Except for Tudeh Party and a small group of followers, everybody else had retracted their support (including General Zahedi who was minister of internal affairs for a few months in the beginning of Mosadegh's government and a close ally). Mosadegh went to the public outside the parliament and while pointing to the parliament building, shouted that all those people sitting inside that building are agents of British! Mosadegh told people that he wanted to dissolve that parliament. He later arranged a referendum to get the people's approval for implementing his decision. This was the exact point where he went against the nation's constitution that was the basis for his powers and privileges. Referendum was carried out in the limited area of the cities in order to make it fast; while most Iranian people lived in villages and small towns. People who opposed such move would have to go to different ballot box or different room (in some cases even different building) to vote against it. Presence of supporters of Mosadegh around those places made such move very difficult if not fatal. The result from referendum was in favor of Mosadegh to dissolve the parliament while according to constitution and its amendments, dissolving the parliament was only possible by royal decree. Mosadegh, despite opposition of many of his own allies (even some high members of National Front like Karim Sanjabi and Kashani), declared the parliament dissolved and sent all MPs home. This matter made Mosadegh the sole ruler of the country. Tudeh mobs were spread throughout the cities chanting slogans in favor of Mosadegh. Dissolving of the parliament was an unconstitutional action committed by the Prime Minister who had taken oath to guard it. This issue paved way for the Monarch to step in according to constitution, and order dismissal of the Prime Minister who was appointed by that parliament which was no longer in place. At this point Dr. Mosadegh committed another unconstitutional action by dismissing the order of Monarch with the excuse that it was fake and ordered arrest of messenger who was an army officer. Mosadegh also ordered arrest of some others including his former allies like Dr. Baghaee who was very close to him before. Country continued swirling down into deeper chaos. Tudeh Party took advantage of this situation and their red banners with "hammer and sickle" had covered everywhere especially in Tehran and Khuzestan. Tudeh demonstrators were constantly on the streets chanting pro Mosadegh slogans and bullying anyone who dared to challenge them. Pro Mosadegh demonstrations and physical confrontations on the streets became much worse after Mosadegh arrested many of politicians and military officers. The next day, in a meeting with some of ministers he ordered toppling the statues of Shah and his father. Apparently this matter had been suggested and pursued by Dr. Fatemi. Karim Sanjabi who was present in the meeting reminded Mosadegh of possible undesired effect that this action might have had on the society and suspicion about intentions of government. Mosadegh advised him not to question his orders and just follow them. Sanjabi conveyed the message to Mr. Forouhar who ordered his followers to bring the statues down. At this point, Mosadegh had even left out some of his ministers in the dark regarding what he had in mind. The day after, Mosadegh had a meeting with American Ambassador who had just returned to Iran in the middle of chaos. Mosadegh told the Ambassador that United States was responsible for all of those troubles. Ambassador did not make any statement in that regard but reminded Mosadegh of dangerous and chaotic conditions on the streets and told him that if Iranian government is unable to guarantee security of American citizens then he had to order all Americans whose presence was not needed to leave the country. Mosadegh did not like the idea and ordered his police to stop the mobs. According to US Ambassador, relative calm returned to the streets after that and was noticeable when he was on his way to Embassy from Prime Minister's office. On August 18, 1953, Abolghasem Kashani (Speaker of the House of dissolved parliament) sent a letter to Mosadegh from his hiding place (he escaped the arrest) and advised him about an upcoming coup. He accused Mosadegh that himself had intentionally contributed to the chaotic situation for self aggrandizement and then leaving the scene like a hero without considering damages to the nation for his actions. He also accused Mosadegh of being an accomplice with United States to bring them into Iranian oil business. Mosadegh responded with a short one liner stating that he noticed his letter. The next day was August 19, 1953. Appointment of Fazlollah Zahedi as new Prime Minister of Iran was declared in the radio which earlier was in control of Mosadegh's supporters. Residents of Capital and other cities that were fed up with miserable conditions that was imposed on them and instability of the country, poured into streets in support of this announcement. Dr. Mosadegh refused to issue any order for confrontation by his followers as suggested by Dr. Fatemi and Mozaffar Firuz. Dr. Fatemi's driver later recalled him to be very mad over this issue and also over refusal of Mosadegh to declare a republic system at that time. Zahedi moved into Prime Minister Office with support of army after arrest of about 200 officers of Tudeh Party military organization who had been stationed in military officers club for orders that never came from their party leaders. The army units which were assigned by Mosadegh's government to keep the orders on the street joined with the forces of newly appointed Prime Minister of the country which arrived in Capital city with armored vehicles. Mosadegh had left his residence where he conducted his day to day office work, and was arrested later. This historical event became subject of many rumors and stories about meddling of Americans, which was first spread in the society with the help of Tudeh Party and Persian program of radio Moscow. Later on contributions from every side made the rumors grow to indicate that United States government was responsible in removal of Dr. Mohammad Mosadegh from power and bringing back the Shah of Iran. These rumors showed that some CIA agents with some money were able to topple the democratically elected government of Mosadegh in Iran. This exaggerated view about CIA and its power in those years was welcomed by Americans themselves. They were more than happy to take credit for what they did not do because it would show them to have more power than they really had. Soon this unofficial story became the accepted version by many while American government never released an official document to show the extent of their "role" in those events until recent years. Here is the story of CIA. According to a document which was published by NY Times and the GWU in 1997, Dr. Donald N. Wilber, in the year 1954, had written a summary of an operation that was conducted by CIA a year earlier in order to remove Dr. Mossadegh from power in Iran and bring Shah back. 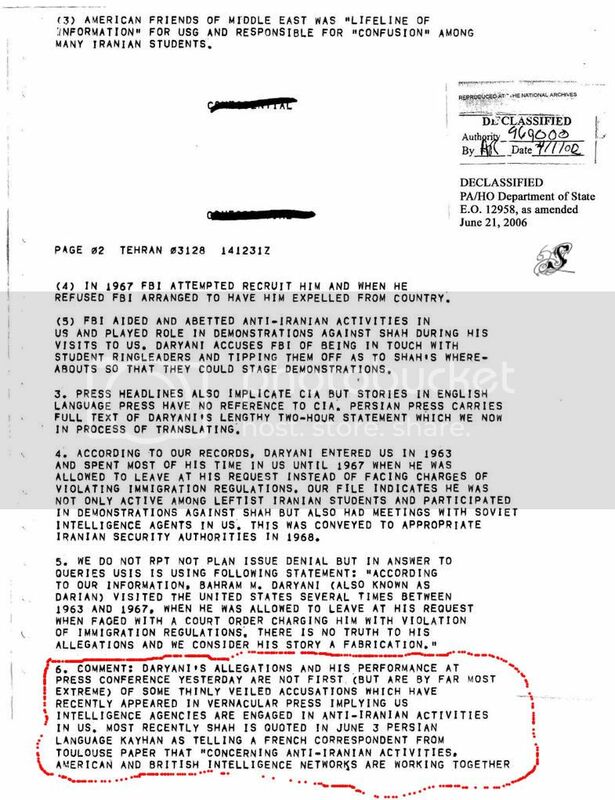 This in fact is the sole document that all stories about CIA covert operation have been flying around without any confirmation from CIA or presence of any other real document from CIA itself about involvement in such operation. Dr. Wilber who according to the preface of same document, had "played active role" in the operation, prepared that document to have "desired record" of such event which despite its importance, CIA apparently had forgotten to do it before! The word "secret" is written on the bottom of every page to make it look very real and even though apparently it was released by CIA but there is nowhere in their achieves that you can find such document. One of the specifications of documents released under FOIA is that you can see different signatures, names and stamps and dates on almost every page of a released document while the word "secret" is crossed over to indicate that the document has been declassified. Neither is true in this document. 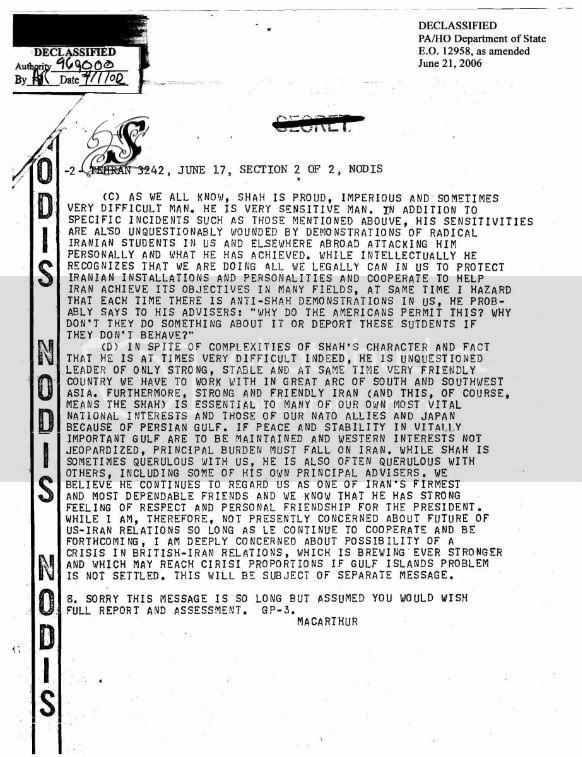 There is nothing to show that this is a true CIA document. "The New York Times has "obtained" a copy of the CIA's secret history of the 1953 Iranian coup. The history was written in March 1954 by Dr. Donald N. Wilber, "the C.I.A. 's chief coup planner," and "was provided ... by a former official who kept a copy." 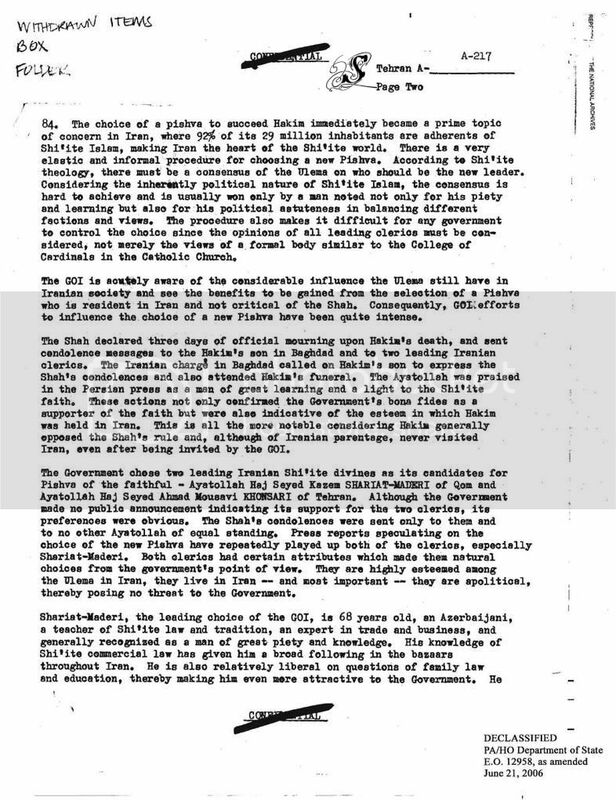 The still-classified document "discloses the pivotal role British intelligence officials played in initiating and planning the coup and it shows that Washington and London shared an interest in maintaining the West's control over Iranian oil...."
Which gives the impression that Mr. Wilber had been in possession of a copy of a secret CIA document since 1954 that himself wrote about history of CIA operation in Iran but he kept that a secret for himself until he died and NY Times magazine which was a well known enemy of Pahlavi�s of Iran in late 1970's, somehow, got their hands on that copy. Whether this whole story is true or not and whether Mr. Wilber has been part of any operation and his writings can be truly considered "history of CIA operation in Iran" according to his own claim, is something that cannot be verified from any of available documents. Despite the questionable reliability and source of the information in this document, many Iranian and non-Iranian researchers have referenced its materials as real historical facts merely based on the claims of the author and the New York Times magazine! Before discussing this document in details, I would like to mention a few things regarding "real CIA documents" which one can easily find from their archives and they are all marked with different emblems, stamps, names and dates as I mentioned above. There is nowhere in any of CIA communication documents in 1953 before, during or even after the events of August 1953 that one can read anything about an operation called "tpajax" or a person called Kim Roosevelt who apparently was the boss of Donald N. WIlber. 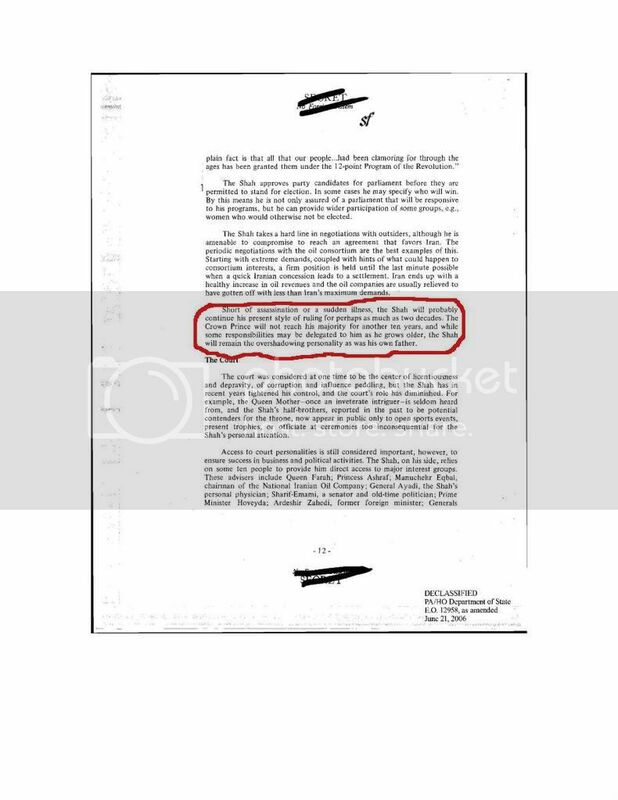 Considering existence and availability of over 1400 pages of CIA documents about the operation In Guatemala which was conducted in 1954, one cannot accept this claim that CIA did not keep a record of their operation in Iran as some of US officials claimed at some point. In another occasion, CIA officials claimed that their documents regarding operations in Iran was destroyed as per routine process, only 9 years after 1953 which makes one wonder why many other older documents related to Iran and other places survived such routine while a document about an event of such high importance for US interests did not? Finally, in 1990's, CIA admitted the existence of a document called "zendebad shah" in their archive but claimed that this document was still classified as "top secret" by US authorities and could not be released to public due to considerations for US national security and interests. 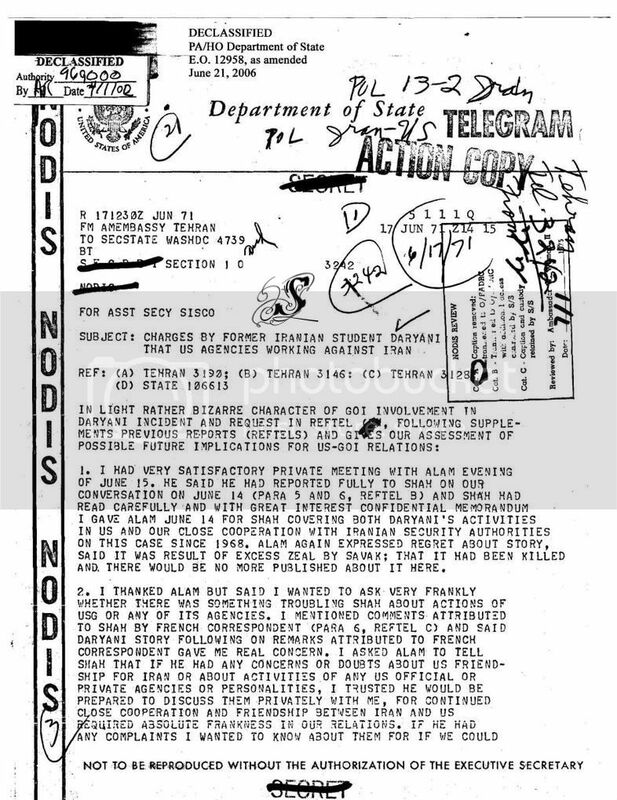 In later developments, GWU succeeded in obtaining some of the documents related to 1953 events including the above mentioned document ("zendebad shah") which apparently was prepared for declassification after Islamic revolution by Scott A. Koch and much of it is still blanked out to indicate the amount of classified information in that document. In the meantime NS Archives in GWU preferred to include the document which was prepared by Mr. Wilber and was in possession of NY Time, in their archives as the only source of information about the events of year 1953 in Iran. 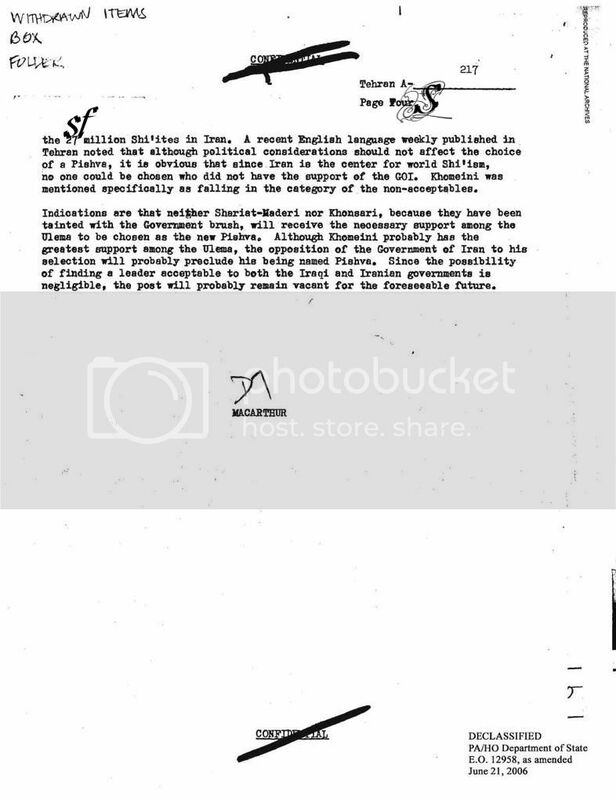 Considering that Mr. Wilber's report, according to his claim, has been prepared in March 1954 and released to public in the year 2000, and there is no document in CIA declassified archives to confirm the information which has been discussed in that, one may wonder about the authenticity of that document and the information in it which has been prepared with fictional writing style. 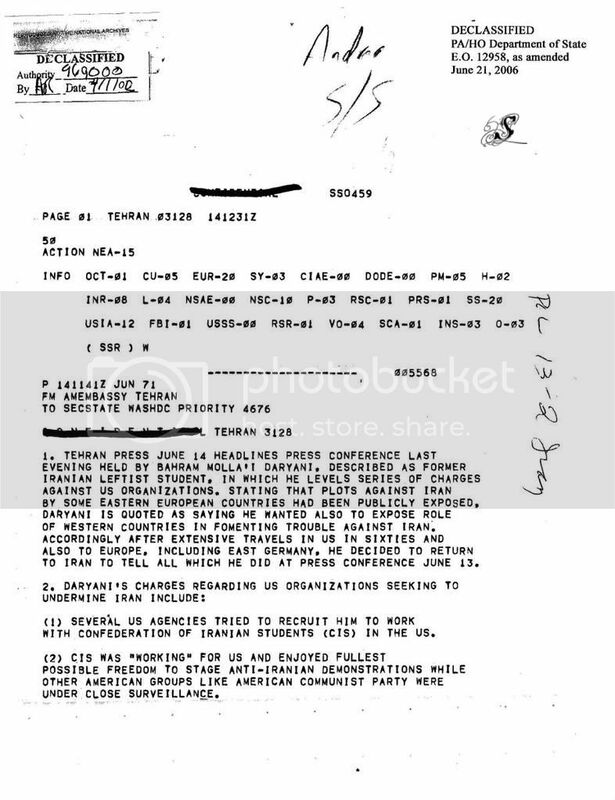 In order to examine the authenticity of Mr. Wilber's report or, as he claims, the "CIA history of TPAJAX operation in Iran" which has over a hundred pages, we also need to look at the real declassified document that has been obtained from CIA by GWU and is available in their archives but before that, let's have a glance at credentials of both Mr. Donald Wilber and Mr. Scott Koch to see how their credentials and qualifications relate to the matter. Mr. Wilber, according to Wikipedia, had a PhD in architectural history from Princeton since 1947 and authored multiple books, most of them related to Iran and Iranian Islamic history. From what we read of himself and his friends, he has been an Indiana Jones kind of figure in his younger age who maintained a great interest in oriental rugs and archeological artifacts. He has been a member of oriental rugs society in Princeton where he associated with friends till last days of his life. According to one of his friends in a tribute to Mr. Wilber, he was recruited by CIA after WW II and worked with them till 1969 that he retired. In a note by one of his friends who has done proof reading of his articles for 15 years, the report about TPAJAX operation had some typos and errors in it which was uncharacteristic of Mr. Wilber even though Mr. Wilber himself had hinted about existence of such document. According to a court's documents from district of Columbia Scott Koch has been working for CIA since 1990 and was assigned to the position of Chief Information Officer (CIO) of CIA in year 2004. In his position, Mr. Koch has been also responsible as Information Privacy Coordinator and in charge of reviewing and deciding about classification and declassification of CIA documents. The documents about CIA involvement in 1953 operations in Iran have been signed and released by him in year 2006. These documents include "zendebad shah" document. 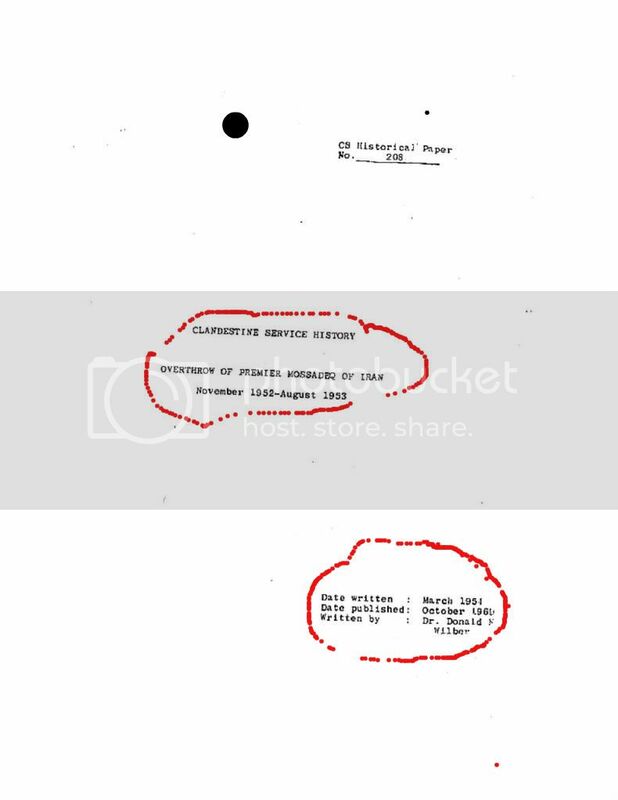 On the cover page of Don Wilber's report we read: "Clandestine Service History" and in second line: "Overthrow of Premier Mossadeq of Iran" and then: "November 1952-August 1953" and at the bottom same page: "Date written: March 1954", "Date published: October 1969", "Written by: Donald N. Wilber". The document discusses a lot of issues and provides many details about the plans and events which gives the impression that, not only the author should have been present in many places simultaneously but also, he should have had a superhuman memory in order to remember so much details with timing and wordings of conversations while himself was not even present at the place where event was taking place. The only other way is that he should have had a lot of notes about details of the events. From the first page in the notes of Dean L. Dodge (historian officer) we read that the report was prepared "because it seemed desirable to have a record of a major operation while documents were readily at hand and memories of the personnel involved were still fresh". Apparently there were enough documents available for Mr. Wilber to extract the required information and mix it with "memories" of the personnel involved to prepare such report. Strangely enough, all the documents apparently have vanished from CIA archives and memories of some of very important elements involved in such major operation seem not only to contradict Mr. Wilber's account but also make it like a totally made up story and pure imagination which was made in the minds of people like Kermit Roosevelt and Don Wilber and was sold for a good price! Before going further, it is worthy to note that these two people were both in the business to make a living while both shared adventurist tendencies and mentality and both were very imaginative characters. Mr. Wilber, according to some of his friends, would love to be viewed like "Lawrence of Arabia" and most of the times especially when in Egypt and Lebanon, would dress himself like Lawrence while other times he showed off with his cowboy hat and jeans. Apparently at some point later, Mr. Wilber who considered himself the engineer of the TPAJAX operation became upset with Mr. K. Roosevelt because Roosevelt had reduced the importance of his role when he wrote his book about this "story" and magnified the importance of his own role! 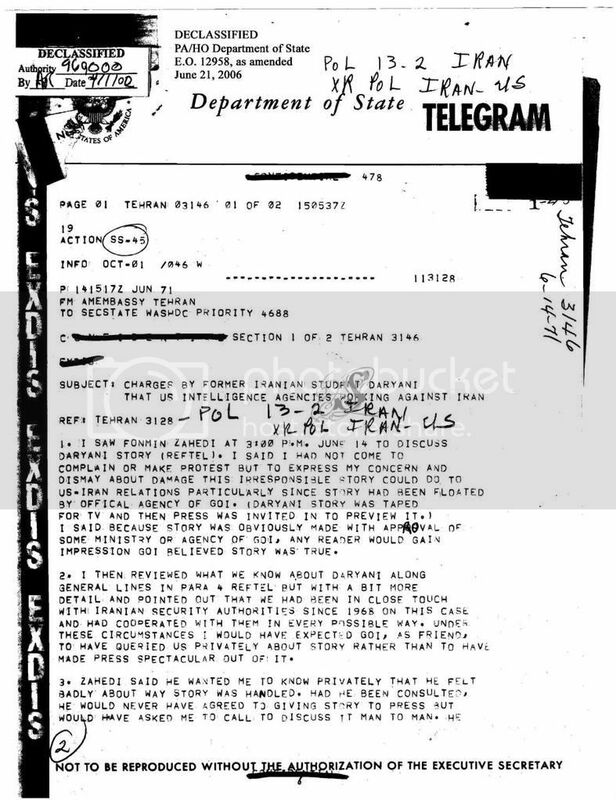 "In March 1953 a telegram was received from the Tehran Station which stated that General [ ] had contacted the assistant military attach� and had requested Ambassador (Loy) Henderson's views as to whether or not the US Government was interested in covertly supporting an Iranian military effort to oust Premier Mossadeq. A meeting was held in the Embassy at which Headquarters personnel, then in the field, and station personnel were in attendance. A cautiously worded reply was drafted at Headquarters and its substance delivered to General [ ]. The reply did not commit the United States in any way but was mildly encouraging and revealed some US interest in the idea. On the basis of the [ ] overture and other clear signs that determined opposition to Mossadeq was taking shape, and in view of the totally destructive and reckless attitude of the government of Prime Minister Mossadeq, General Walter Bedell Smith, Undersecretary of State, determined that the US Government could no longer approve of the Mossadeq government and would prefer a successor government in which there would be no National Frontists. 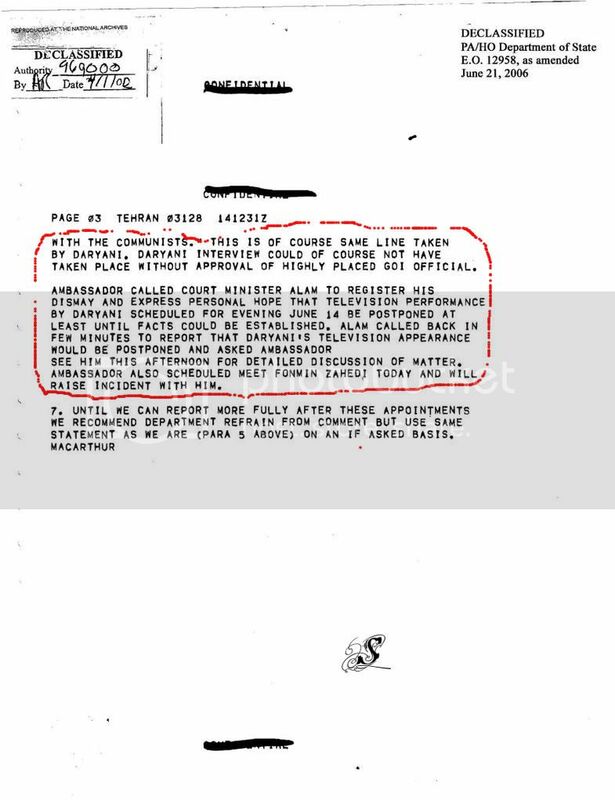 The change in policy was communicated to CIA, and the NEA Division was informed that it was authorized to consider operations which would contribute to the fall of the Mossadeq government. The Department of State and CIA jointly informed Ambassador Henderson and the Chief of Station, Roger Goiran, of the new policy and of the operational authorization. The Director, on 4 April 1953, approved a budget of $1,000,000 which could be used by the Tehran Station in any way that would bring about the fall of Mossadeq. Full authority was given to Ambassador Henderson and the Chief of Station enabling any part or all of the $1,000,000 to be used without further authority, as long as the Ambassador and the station concurred." "Ashraf reached Tehran as a passenger on a commercial flight on 25 July. As expected, her unauthorized return did create a real storm. Neither the Shah, himself, nor the government of Mossadeq had been asked to permit her to return. Both were furious. The Shah refused to see her but did accept a letter passed on through the medium of [ ], ** head of the Shah's [ ], loyal and devoted in an effective way throughout this period. This letter contained news that US General Schwarzkopf was coming to see the Shah on an errand similar to that of Ashraf, herself. The Shah welcomed this news and received his sister on the evening of 29 July. The session opened stormily but ended on a note of reconciliation. On the next day she took a plane back to Europe. This was as had been planned, but it came as a relief to know that she was out of the country in view of the pro-Mossadeq press reaction." "The second emissary arrived on the scene in the person of [ ], the principal SIS agent. According to the plan, [ ] initial task with the Shah was to convince the ruler that, [ ] was the official spokesman of the UK Government. The advance plan, that of having the Shah select a key phrase which would then be broadcast on the British Broadcasting Company (BBC) Persian language program on certain dates, was followed. In London the necessary arrangements had been made by Darbyshire to send the phrase over the BBC. On 30 July and again on the 31st the Shah saw, [ ]. He had heard the broadcast, but he requested time to assess the situation. , [ ] was, however, able to prepare the Shah for the visit of the American emissary, General Schwarzkopf, and to stress the point that this emissary would repeat the message and, hence, give an additional guarantee of the close collaboration between the United Kingdom and the United States in this undertaking. Schwarzkopf had been chosen by the drafters of the operational plan because of the fact that he had enjoyed the friendship and respect of the Shah in the period from 1942 until 1948 when he headed the US Military Mission to the Iranian Gendarmerie. Approached on 26 June 1953 by John Waller, Chief, NEA, briefed at Headquarters on 19 July, Schwarzkopf took to his mission with relish. He said that he had a reputation with the Shah for telling him unpleasant truths that others withheld from him, and he stated that he was sure he could get the required cooperation from the Shah. Schwarzkopf was given a cover mission consisting of a short tour to Lebanon, Pakistan, and Egypt so that his visit to Tehran would appear as a brief stop en route to a principal destination. Schwarzkopf left by air for Beirut on 21 July. Schwarzkopf's mission was to obtain from the Shah the three papers which are described more fully in the operational plan. They were: (1) a firman naming [ ] as Chief of Staff, (2) a letter indicating his faith in [ ] which the latter could employ to recruit army officers for the plan in the name of the Shah, and (3) a firman calling on all ranks of the army to support his legal Chief of Staff. It was felt that it would be easier to get the Shah to sign such statements than to issue a firman dismissing Mossadeq. It was also believed that the action of replacing Mossadeq would be initiated through the Majlis." "HENDERSON: In June 1953 I was ordered back to the United States for consultation, and since I had had no leave, the Department suggested that I take some on the way back. The situation in Iran had become so complicated that the Department felt it might be better that I delay my return. Iran was in a desperate financial situation. who had served as a messenger; and that the Shah had flown to Baghdad. I was so upset by this news that I could not sleep during the night, and I reproached myself for not having been on my job in Tehran. The next morning I called the Embassy by telephone and asked that it send our Naval Attach�s plane for me. I arrived in Tehran in the afternoon of Monday, August 17, and was met at the airport by Mossadegh�s son, members of the Embassy, and a detachment of soldiers to accompany me to the Embassy. On my way to the Embassy, I found the city in confusion. Mobs with red flags were tearing down statues, destroying street signs which bore the name of the Shah or his father, pillaging shops, and beating up some of the shopkeepers. learned that during the last two days many attacks had been made upon Europeans in the city and the suburbs; that the -chauffeur of our Naval Attach� had been stabbed while trying to defend the automobile; and that many Americans were being threatened. On Tuesday morning I received a telegram from our consulate in Isfahan stating that several thousand persons bearing Communist flags and shouting in Persian "Yankees, go home" had been parading in front of the consulate. I met with Mossadegh late Tuesday evening. I found him fully dressed and neatly groomed sitting in his reception room, an indication that he was planning a formal conversation. He began at once to upbraid me for the Shah�s attempt to dismiss him. He said that there could be no doubt that the United States was responsible for the Shah�s action, and it would now be held responsible for the aftermath. I said that I had not come to argue about who was responsible for what had taken place but to discuss the danger in which American citizens in Iran now found themselves. I said, "Communist mobs seem to be in control of the streets; and the police, apparently under orders, are not attempting to control them; foreigners are being attacked; one of our Embassy chauffeurs has been stabbed. In Isfahan thousands of demonstrators, carrying Communist flags and using threatening language, are demonstrating in front of our consulate. Unless you can give me assurance that this violence and threats of violence will be stopped and American citizens and property will be given protection, I shall immediately order all American women and children and all the official American citizens whose presence here is not urgently needed to leave the country." the United States is entirely deserting Iran." I answered, "We would not be deserting Iran; I would be here and all the Americans who are needed would still be here, but as long as the police do not give them proper protection I do not want those who are not really needed to remain. If they do, incidents can take place which could seriously injure the relations between our countries." pleasure, were busy dispersing the gangs in the streets and trying to restore order. I understood later that the Communists were furious at the interference of the police and returned to their homes feeling that Mossadegh was double-crossing them. demonstration, therefore, were men with almost frightening physiques, and they were rapidly joined by people on the street. Members of my staff whom I had sent out to find what was going on kept us informed by telephone. Within an hour the demonstrators reached the building which houses one of the leading pro-Mossadegh newspapers and destroyed the plant. I was confident that when the crowd would come into contact with the military, it would disperse, but to my surprise the military joined it. By noon the demonstrators had taken over the Foreign Office and a little later the area surrounding our Embassy compound was full of cheering people. General Zahedi, whom the Shah had appointed to succeed Mossadegh, and who had been in hiding, came out and seated on a tank moved through the applauding, waving crowds. servants. They should be told by radio that they should report to work tomorrow as usual." During the next twenty-four hours, Mossadegh was captured and imprisoned pending a trial. Most of the Iranian diplomatic and consular offices carried on as usual. On the following day the governmental machinery was for the most part functioning. Zahedi proceeded to set up a new cabinet for the Shah�s approval. The Shah, who was in Rome on the day that Zahedi took office, returned to Tehran on August 22. I have never seen Tehran so happy as it was when it greeted him back. MCKINZIE: Okay. Shortly after that there was an article in the American press, that you may know about, contending that Allen Dulles and Norman Schwarzkopf and a sister of the Shah . . .
sure that Schwarzkopf had nothing to do with the affair. I am not prepared, however, to say that the CIA had nothing to do with some of these developments. It has been charged that the CIA inspired the uprising that started with the march of the members of the athletic club in Tehran. Whether it did or did not, I honestly don�t know. When I returned to Tehran, I was under the impression that Mossadegh, at least for a time, had won his long conflict with the Shah. When I talked with Mossadegh on the evening of August 18, I had no idea that an attempt would be made to overthrow him by force. I was surprised by the events that took place the next day, and I think that if they are ever published, my telegrams to the Department will support what I am saying. I am sure of one thing, however. No matter how skilled the CIA might be, it could not have engineered the overthrow of Mossadegh if the people of Iran had not overwhelmingly been in favor of the return of the Shah." Interesting part of the whole story is that CIA never accepted existence of such document that NY Times has published as true story of Mosadegh's fall from power and claimed that all documents have been destroyed in process of routine clean up to make space in archives. And this is while there is absolutely not a single reference to any operation with the name of "tpajax" in any communication documents (cables, telegraphs, letters and reports) of US government at any time. There are thousands of pages of US government documents which have been released according to FOIA and not a single one provides such impression that US government had been conducting any operation of that magnitude and with that name against Iranian government. 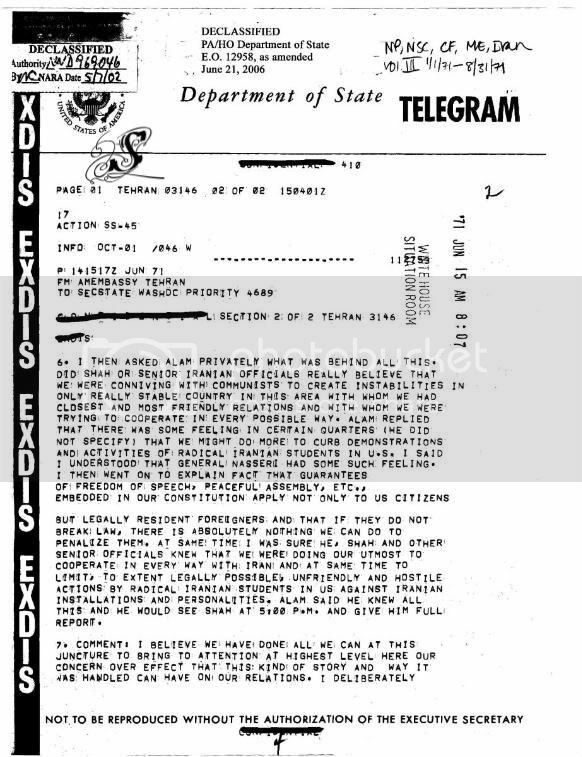 If we consider the operation which was carried out by US secret service in Guatemala during 1954 regarding which hundreds of pages of documents have been released by the government with CIA emblem on the cover and the name of operation in the subject line of many pages, then we should think twice before trusting authenticity of so called "tpajax" operation story made by a couple of business men and adventurists. It is naive if we accept the explanation of US government regarding absence of document (routine clean up to make space?) while thousands of pages of documents from the time much earlier than that and related to much more insignificant issues are still available in the archives. You can find the official communication documents about Guatemala from 1951 and even earlier in there. The only acceptable explanation is that such document never existed because such kind of operation never happened except in the minds of its creators. Why do American officials resort to such vague statements regarding such event when they try to address Iranians? Obviously manipulation of people�s opinion in the region and also inside United States by emphasizing magnificent powers of US intelligence services while presenting an honest impression can�t be ruled out as one reason. * Parts of this article have been published in previous years in other forums and also in my blog. The story of CIA coup against Prime Minister Mosadegh, other than imaginative skills of Kermit Roosevelt and Don Wilber, apparently had some roots in realities of some events that probably were organized by these characters to take advantage of them in future and possibly making some fortune from the oil companies that would benefit from the change of direction regarding oil in Iranian government policies. Kermit Roosevelt's background in OSS (Office of Strategic Services) where he worked as an officer in Middle East during WW II had provided him with an opportunity to become familiar with the history and politics of the region. According to one story, he was later recruited by Frank Gardner Wisner in 1950 to work in espionage operations and participate in overthrow of Prime Minister Mosadegh in 1953, but there is absolutely no real official record of such plans and operations anywhere. According to same story, Frank Wisner arranged a meeting between Kim Roosevelt and President Eisenhower upon his return to United States and Roosevelt briefed the President about the Operation Ajax. As per Daniel Yergin (who is quoting from so called planners of the coup) in his book "The Prize", after that meeting, President Eisenhower noted in his diary "with admiration", the Operation Ajax seemed more like a dime-novel than a historical fact. In fact, not only the "Operation Ajax" but also the meeting with President has been nothing other than a dime-novel! The meeting records of President Eisenhower for the whole month of August (and the months after that) in 1953 which has been declassified without any blanked space; has no indication of such event and there is no sign of the diary where Eisenhower made such remark while a whole lot of President's diaries on different issues are available. According to same stories, Frank Wisner was also responsible for planning the operation in Guatemala in year 1954. 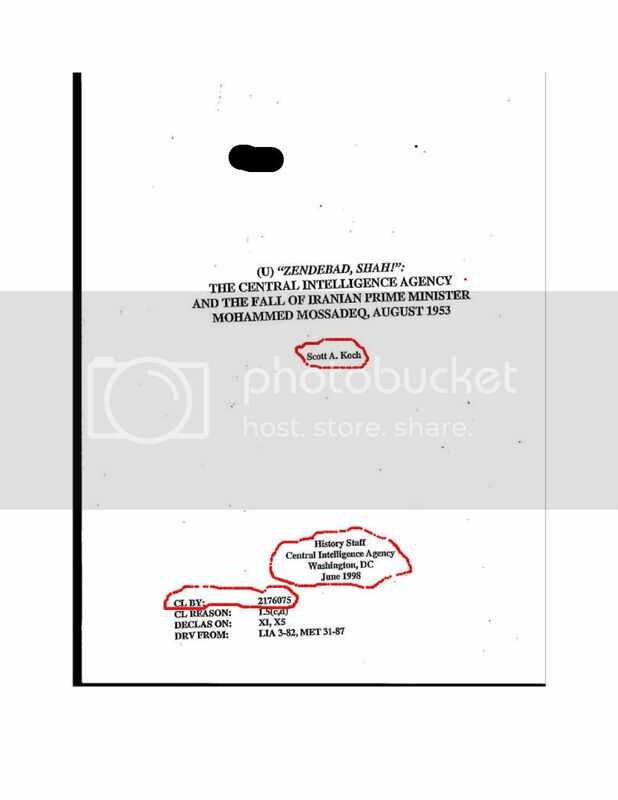 As mentioned in earlier parts, while one can find plenty of documents regarding the covert operations in Guatemala with all kinds of information including signatures, names, emblems, dates and name of the operation (Operation PBSUCCESS) in the subject line, there is absolutely not a single page of that sort regarding so called operation Ajax! Daniel Yergin, quoting from "one of the operation's planners", provides a less wacky version of the Ajax story: "Operation Ajax created 'a situation and an atmosphere in Tehran that forced the people to choose between an established institution, the monarchy, and the unknown future offered by Mossadeq' Even so, success had been by no means certain.� As we can see from Mr. Yergin's version of "Operation Ajax", it seems like Kim Roosevelt and co considered a little discount in their heroic James Bond story and settled for "giving Iranian people a choice between Shah and Mosadegh" rather than story of "removing Mosadegh and installing Shah". Some honest remarks that have been made by Shah and Princess Ashraf Pahlavi in their books also seem to have contributed to such stories to some degrees. 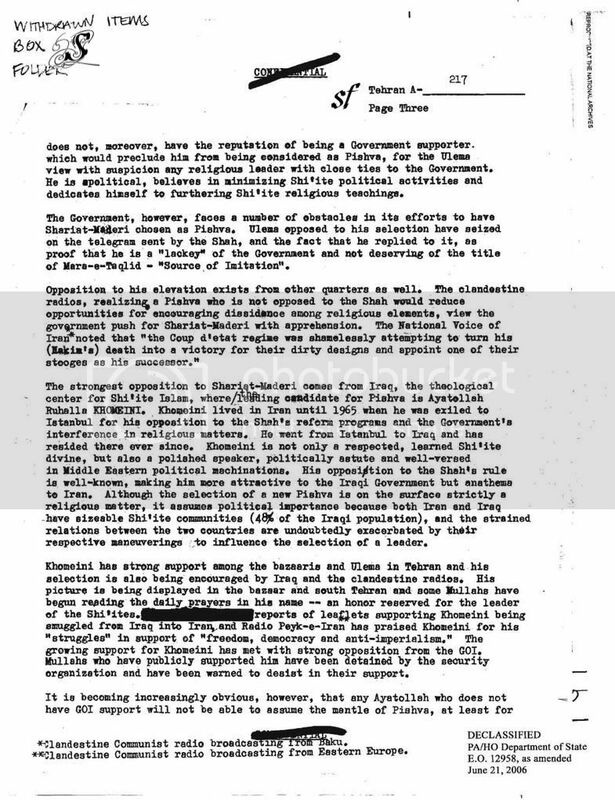 In the book "Answer to History" Shah, with doubts, mentions the "Operation Ajax" after admitting that he had a meeting with Kermit Roosevelt on August 16/1953 to hear about the views of US government about Mosadegh after he had dissolved the Parliament against the constitution to see if US government still supports Mosadegh's policies. After Shah received assurances of US government that they were not supporting Mosadegh then he decided to use his constitutional privileges and power to remove Mosadegh for moving against constitution. Shah also states in his book that documents show that CIA had spent $60000 in those days while expressing doubts that such amount of money could have created such effects in a country like Iran. According to Princess Ashraf Pahlavi who had been expelled from Iran by Mosadegh as a precondition to work as a Prime Minister, Mosadegh was encouraged by Henry Grady (American Ambassador) in his policies regarding oil nationalization hoping to push British out of the region but later, their views changed and they realized that Mosadegh was not able to resolve the oil dispute. Comments made by Loy Henderson (next US Ambassador) in American oral history regarding his meeting with Mosadegh on August 18/1953 that implied Mosadegh might have tried to use his meeting with American Ambassador as a means of propaganda if they met publically, to show that US government was supporting him, confirms such views. Princess Ashraf states that, in the summer of 1953, she met an American and a British men in France, who told her that they were representing John F. Dulles and Winston Churchill and intended to help Shah in resolving the oil issue. The meeting had been arranged by an Iranian whose name is identified only as Mr. B. The two representatives asked her to go to Iran and deliver a sealed envelope to the Shah without anyone else knowing about the mission. Princess Ashraf accepts to do that and goes to Iran and delivers the envelope without having any information about the content. She later hears from a radio (after she was ordered back to France by the government) that Shah and his wife have left the country after a failed coup and she wonders if the failed "coup" that the radio was talking about, was the same plan that Mr. B's friends had spoken about with such certainty. A couple of days later, when she was on her way to go and see the Shah in Italy, she hears about demonstration against Mosadegh and in support of Shah and concludes that, this was probably the plan that she had been told about by the American and British agents. Ashraf states in her memoirs that apparently some money had been spent to print Shah's pictures and distribute them among Iranian people in this operation. It is unclear why CIA and MI6 insisted to involve Ashraf Pahlavi in such operation while they knew that she was under strict order by Mosadegh not to go back to Iran and was closely watched by Mosadegh's government agencies. Ashraf was confronted by governor of Tehran the same day that she arrived in Tehran and was asked to leave the country which she refused but was finally forced to leave about a week later. 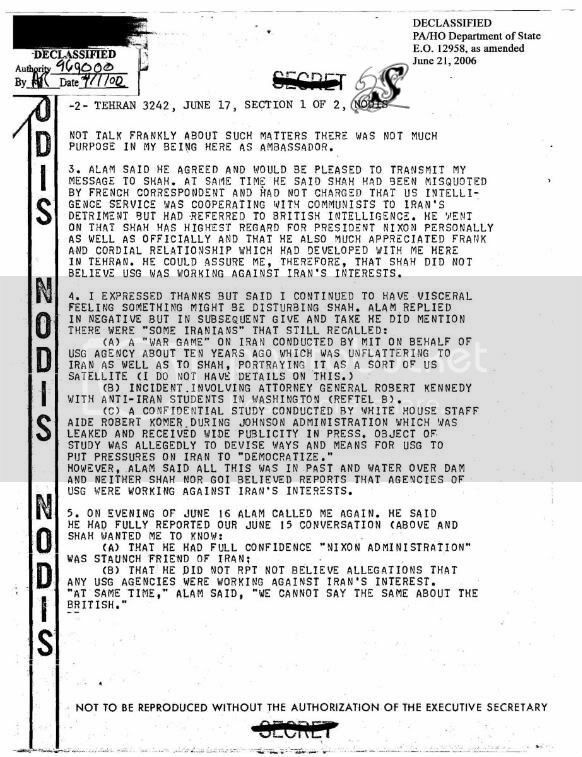 After all, it seems the only substance to the whole "dime-novel" of Operation Ajax, was informing the young Iranian monarch about US position which did not support Mosadegh's policies (after losing faith in Mosdegh's ability to properly resolve the oil issue) through informal channels (US Ambassador was not present in Iran at that time and was not happy to be used by any side in the conflict between Mosadegh and Shah) and also printing some pictures of Shah for distribution (IF that is not another made up story by Roosevelt and co to make a bill for unverifiable business transaction to scam US government for some money) among residents of Tehran who were ready to support their monarch in those critical days. Daniel Yergin confirms in his book that fall of Mosadegh was inevitable and Shah also states that, it took about 30 months for Iranian people to clearly see what Mosadegh was capable of and when the time came to choose, they decided to reject him. It is inconceivable to accept that a popular government leader in a country of 20 million people (at that time) can be removed with such petty amount of money and such cheap tricks and it is disrespect to the intelligence of Iranian people to accept and promote such unfounded views. Late Dr. Mohammad Mosadegh was definitely a patriotic Iranian but his abilities as a Prime Minister were in doubt and not of the best quality. He could probably serve the best as an opposition leader but running the affairs of a nation with such magnitude of political, economic, and social problems was too much for him and his mistakes under manipulative influence of some of his associates put the nation on the path of constant crisis towards final disaster. Mosadegh in his memoirs wrote that, on August 27th, he ordered to arrest anyone who spoke a word about Iranian republic system as Iran was a constitutional monarchy and should have remained that way. He also mentioned that he intended to write a letter to the Shah and plead for his return. This was the same day that Dr. Fatemi had become disappointed in him and the next day was seen cursing Dr. Mosadegh for refusing to declare a republic. Mr. A.H. Meftah who worked as an assistant to Dr. Hussein Fatemi and had met Dr. Mosadegh in Hague to render some advice, in his book "Truth Has No Color", provides a lot of valuable information about the policies of Mosadegh's government and the last days events in August 1953. Mr. Meftah states that when he told Dr. Mosadegh about a rumor regarding his (Mosadegh) meeting in which he told some members of parliament in his house that British would surrender to his demands after 2-3 months the most. Mosadegh confirmed such statement and said that was the truth and Mr. Meftah expressed his surprise and disappointment that his Excellency, the Prime Minister Mosadegh had started such important campaign without preparing a proper plan. After listening to Mr. Meftah for a while, Mosadegh who was clearly disturbed of the information which was presented to him told him that not even two members of his cabinet can agree with each other and then asked what could he do? Late Shah in his book "Answer to History" states that after fall of Mosadegh, it became clear that Tudeh Party had prepared to take over the country by removing Mosadegh and declaring a republic in two weeks. Shah also wrote that he had personally seen the information and the stamps that had been prepared for republic of Iran by them in advance. Nevertheless, some people continue to take advantage of the confusion created through made up stories to invent untouchable heroes and hide behind them for self agenda promotion or making some business through selling books while Iranians continue to suffer because of these unfounded stories. Some people argue that Dr. Mosadegh did not break any law during his work as Prime Minister of the country. This argument is not correct. Mosadegh committed several constitutional mistakes and disregarded articles of the constitution in different instances from which the most important one was dissolving the parliament (article 48 ) and conducting a referendum with open/non-secret ballots which was against democratic rights of people to express their views freely in such event. He also disregarded the order of Monarch to yield office to a successor (article 46) after the parliament was dissolved. Mosadegh certainly gained his power through a democratic process which was at work at that time but he did not leave his position based on same democratic process and laws which allowed his dismissal by monarch in the absence of a parliament that was dissolved by him illegally. After Mosadegh's government was replaced with a new government in Iran, it took a few months until the oil started to flow again. A new era in Iranian oil industry began and a consortium of different oil companies that included some American and French companies joined the operations in Iran. After decades of following the informal agreement of "as is" between American and British oil companies to stay away from each-other's region of influence, Americans succeeded to force themselves in Iranian oil business. US financial aid which was in negotiation between Iranian government and Americans since the time of Prime Minister Mosadegh to cover for the loss of oil revenue and dealing with economical consequences of that, was delivered to new Iranian government. Relations between Iran and US grew rapidly to replace the relations with British as an element of balance against the powerful northern neighbor, the Soviet Union. The events of 1951-1953 and long period of instability and chaos which had shown its negative effects in the world affairs by destabilizing oil market and world economy, made US and British governments doubtful about future of Iran. During the same years, many among Iranian elite had started to turn their attention to United States as a new center of power politics in Iran. A few years after 1953, Iranian government initiated its security intelligence organization to counter the anti establishment activities which were mostly influenced by communist world and ideology. According to different sources, this matter was done with the help of CIA of United States and Israeli intelligent service which provided guidance to Iranian government and training to the personnel. General Teymour Bakhtiar (a relative of Shah's wife, Soraya Esfandiari Bakhtiari, at that time) was the first director of this organization until 1961. General Bakhtiar had a shiny military record in his bag as a veteran in the battles to free Azarbaijan from communist occupation. He had been promoted to the rank of General by Fazlollah Zahedi when he became Prime Minister after Mosadegh. He was then appointed as governor of Tehran until 1957 which he was assigned as head of SAVAK (the short form for sazemane etela-at va amniyate keshvar). Teymour Bakhtiar has been credited with discovery and destroying of Tudeh Party's military organization in the beginning of his work as director of intelligence service. His dismissal by Shah in 1961 was allegedly based on Dr. Amini's recommendation who had warned Shah about General Bakhtiar's contacts with President Kennedy of United States. General Bakhtiar was later assassinated in Iraq after he fled from Iran to avoid arrest for attempting a coup against Shah. A few years earlier, during late 1950's, another coup which was apparently planned with the help of CIA had been discovered. General Valiollah Gharani who was head of army's counter intelligence organization since early 1950's along with some civilian friends from whom, some were CIA elements were implicated and arrested. Apparently, General Gharani who became disappointed after losing competition to Bakhtiar for leading newly established SAVAK, and was very aware of the Americans interest in reforming Iranian system (probably through his friends in CIA), decided to get closer to Americans in order to implement his plans for changing Iranian system when he was sent to United States for training. He met Dr. Amini who was Iran's Ambassador to US at that time. According to Abbas Milani in his book "Eminent Persians", a CIA intelligence estimate report during those years had indicated the possibility of a military man getting into action against Shah along with some civilians in order to impose limits on the monarch's power in the country. As per his account the appointment of Gharani had been done in that context. Milani also states that around the same time, Americans used their influence to form a group from parliamentarians and politicians who favored premiership of Ali Amini while they covertly published articles in media and demanded for reforms. General Hussein Fardust, in his book �Rise and Fall of Pahlavi Dynasty", states that Americans had built a trust in Gharani; for his role in removal of Dr. Mosadegh from power in August of 1953. After his return to Iran, General Gharani made contacts with American Embassy and CIA operatives in Iran to organize his plans for coup. Among these civilians the names of Manouchehr and Esfandiar Bozorgmehr ( who is possibly the same person whose name is mentioned as Mr. B by Ashraf Pahlavi?) can be found. Esfandiar Bozorgmehr (his son, Yousef has been recently defending Mahmoud Ahmadinejad and his victory in Islamic Republic presidential election of 2009) worked as a journalist in those days and his older brother Manouchehr was a lawyer. Iranian history professor, Abdullah Shahbazi (in Iran), believes that Bozorgmehr brothers were the same people whom Kermit Roosevelt had contact with in Iran without mentioning their real names. General Fardust states in his book that Esfandiar Bozorgmehr was in contact with CIA station in Athens Greece where he travelled frequently. 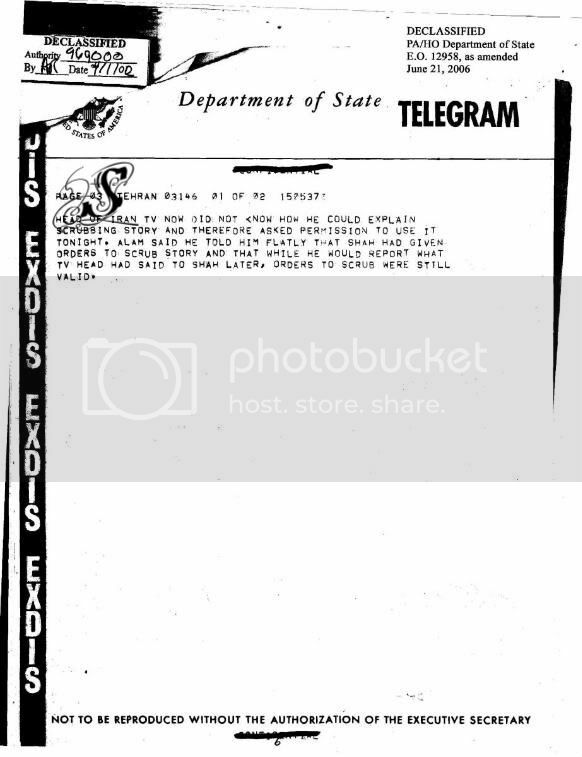 According to Mr. Milani the contacts between Gharani and American Embassy started in 1956 after Gharani received the news that J. F. Dulles was going to Iran for a visit and the final meeting between him and three officers of American Embassy was in the house of Esfandiar Bozorgmehr in January of 1958. General Fardust claims that this information was provided to Iranian government by MI6, the British Intelligence Service along with some other documents. About a month later, Bozorgmehr was arrested in the airport when he was returning from Greece in February of 1958. General Gharani and some other accomplices were arrested later. This incident indicates the ambiguity of politics and uncertainty of both British and Americans towards the situation in Iran and their rivalry against each other which have taken a lot of twists and turns. No doubt, all of those activities had something to do with Iranian oil. In May 1961, Shah appointed Dr. Ali Amini as Prime Minister after Mr. Sharif Emami had some argue and confrontations with parliament members and the Speaker Of The House. It is believed that this action was supported by US government which was putting pressure on Shah for reforms and considered Amini as the person who could bring such reforms. Dr. Amini asked Shah to dissolve the parliament promising that he would start a new and fair election soon. Election never happened and media started calling Amini a dictator who talked too much. Cartoonists would draw him with microphone in the bed! During his premiership, Shah visited United States and met President Kennedy in April of 1962 and became familiar with the expectations and the points of US administration regarding reforms in Iran. This matter became foundation for the arguments by those who opposed Shah on any issue, to claim that US government has been the mastermind of White Revolution in Iran. A couple of months after Shah's return, he removed Dr. Amini and replaced him with Asadollah Alam, an aristocrat from North-Eastern province of Khorasan. Alam kept some of cabinet members of Amini in his government which included Minister of Agriculture; Arsnjani who had conducted some land reforms during Amini's government. Later, in 1963, Shah introduced his 6 point reform plan called White Revolution which included: Land Reform; Nationalization of Forests; Privatization of the Government Owned Enterprises; Profit Sharing for industrial workers; Extending the Right to Vote to Women; Formation of the Literacy Corps. The reform was opposed by majority of landlords and clergymen. Most serious opposition came from Ayatollah Khomeini who attacked Shah in a speech that resulted in anti government riots and the arrest of Khomeini himself. Khomeini was later sent to exile but he was a person of interest to CIA and US government as a man who opposed the expansion of Shah's authorities and was compared with religious leaders of Constitutional Revolution (based on declassified documents of US government), and his situation was monitored from that time. Dr. Lajvardi: �Q. .... was the U.S. influence into the content of the white revolution. Someone I once interviewed told me that the whole White Revolution, especially the land reform part of it, was cooked up in the basement of the White House by Robert Komer, but I was never able to substantiate this." Establishment of OPEC cartel in 1960 to take control of the oil prices by oil producing and exporting countries, based on a proposal by Venezuelan Minister of Energy Juan Pablo Perez Alfonso, started a new era in relations between oil producing nations and international oil companies. Initial members included 5 nations of Iran, Iraq, Kuwait, Saudi Arabia and Venezuela but successful operation of the cartel in the beginning to increase oil revenue for member nations, attracted most of major oil producing nations in the years after that. By late 1960's and early 1970's, OPEC was strongest oil cartel in the world which held control over the international pricing of this important source of energy. Increasing price of oil had a great impact on development and flourishing of economy in Iran which was still suffering of poverty after noisy events of early 1950's in the oil dispute with British that had not produced the nation with enough resources from oil production to implement major development projects. In the same year that OPEC was taking shape, another organization which later influenced developments in political affairs of Iran was formed by some Iranian students who lived in some western countries. This organization that took the name of Confederation of Iranian Students (CIS for short), was started by those Iranian students who were mostly followers or sympathizers of Tudeh Party and National Front of Iran while sympathizers of National Front dominated the organization in the beginning. CIS continued to grow by attracting more of Iranian students which their number continued to rise and, later moved to United States that, in those days, had a biggest attraction among Iranian young generation and students who wished to continue their studies abroad. Supremacy of nationalist elements within CIS did not last very long and shortly, Marxist elements along with those who wanted to combine Marxism and Islam became dominant in the organization and National Front supporters took the back seat. In 1962, Shah Mohammad Reza Pahlavi had a visit to United States to meet President John Kennedy in order to receive more aid for industrial development of the country and expansion of military. President Kennedy advised Shah that United States would like to see some political and social reforms in Iran. Dr. Ali Amini who was favored by US administration to implement such reforms had become prime minister of the country nearly a year earlier (Shah has mentioned support of US government for this appointment in his book). Iranian parliament had been dissolved in the beginning of Amini's premiership as a precondition for him to take the job with the promise of election in near future. During that year, Hassan Arsanjani who was Minister of Agriculture in Amini's cabinet, initiated a limited land reform in order to create a balance in distribution of wealth in Iranian society which was mostly made of peasants. This limited reform did not include vast properties of many big land owners whose associations with centers of power helped them to influence the process of affairs in the government in their own interest. During the same period, Mohammad Derakhshesh was minister of culture in Dr. Amini's cabinet which at that time, was responsible for the affairs of education from elementary level to post graduate studies. Mr. Derakhshesh was a member of teachers association from earliest times and had contributed to teachers strikes against government in different occasions from which, one was during the Prime Minister Qavam-Ol-Saltaneh when Dr. Shayegan was minister of culture. Apparently the appointment of Mr. Derakhshesh to cabinet position was to resolve the issues which Iranian teachers were struggling with at that time but no real important change came out of that and teachers associations were turned into an entity that Tudeh Party (despite being officially banned of activities) continued to influence and manipulate. A couple of months after return of Shah from United States, Dr. Amini's government was replaced by Asadollah Alam who himself was one of major land owners of Iran in the north-eastern part of the country, the province of Khorasan. Earlier, Alam had implemented his own version of land reform in the region belonging to his family which was welcomed by the government. About seven months after Alam became Prime Minister, Shah launched a "6 point program" that included reforms in different social and economic areas for the nation. This reform was labeled as "White Revolution" due to overwhelming support that it received by Iranian people all over the country through a referendum without spilling any blood. This matter did not last very long. A couple of weeks later, Ruhollah Khomeini, an unknown middle aged cleric at that time, strongly denounced the Shah's reforms in Qom to create a stir in the society. This matter dragged Iranian armed forces to Qom under orders of government to silence the opposition. During the months after that, clashes between Iranian government forces and clerics and other supporters of Khomeini escalated into a bloody confrontation in which a number of Khomeini's supporters and clerics were killed. The foundation of Khomeini's opposition was based on the arguments in which he accused Shah of violating the constitution by proposing and launching such reforms. He also accused Shah of promoting corruption in society by granting more rights to women and yielding to demands by Americans for reform. This notion was promoted quickly and became a solid belief among those who opposed Shah during the years after that (probably even today) to claim that "White Revolution" was cooked by American government while a former US Ambassador to Iran in an interview with Dr. Lajvardi of Harvard Oral History Project, has made it clear that American government, other than expecting to see some reforms in social affairs, had no part in details of "White Revolution" and were even surprised by one of the articles that called for sharing profits of manufacturing units with workers. 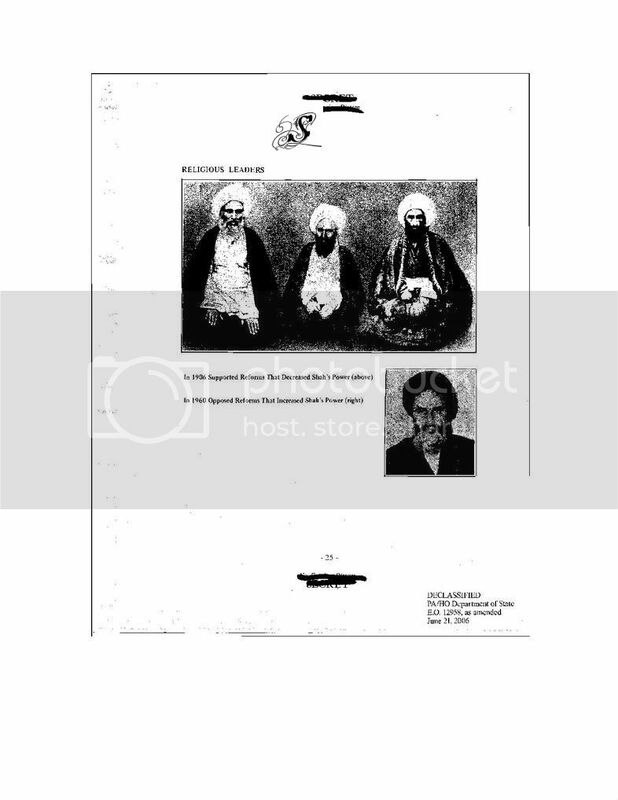 In a CIA report of the same years which has been declassified recently, Khomeini's actions were compared with the actions of ayatollah Behbahani and ayatollah Tabatabee during the Iranian Constitutional Revolution (early 1900's) in which those ayatollahs intended to limit the power of monarch while, according to this document, Khomeini opposed the expansion of monarch's powers. 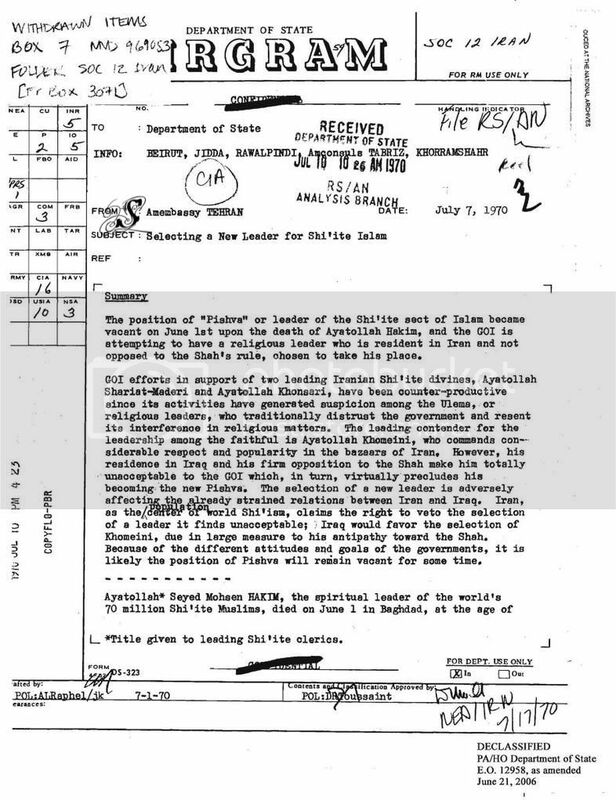 In another communication document of CIA, the actions of Shah in meddling with selection of Shiite Marja after death of Ayatollah Hakim to prevent Khomeini from ascending to status of Marja is discussed which indicates the importance of the matter to US government for unknown reasons at that time. Khomeini was arrested and released shortly but this matter did not have any effect on his activities and speeches against the government. After ratification of a bill in the parliament to grant political immunity to American Military personnel during premiership of Hassan-Ali Mansur who became Prime Minister after Alam, Khomeini argued that Iranian government had submitted to capitulation by accepting that American military personnel in Iran to be exempted from being trialled in Iranian courts for any legal issue. This, apparently, was a prerequisite by American government for providing military aid to any friendly nation and Iran was no exception in this way. This issue resulted in Khomeini's arrest and imprisonment for a few months before he was sent to exile for continuing his opposition to reforms and policies of the government. Many of Khomeini's supporters among lower rank clergies and also some in Tehran bazaar were arrested as well. Khomeini's revolt was suppressed temporarily and calm returned to Iranian cities. The White Revolution reforms provided the nation with relatively good development opportunities in the areas of social and economic affairs while political arena was still reserved for certain group of people who had proven their loyalty to the establishment (as it is in every society) which was heavily influenced by the top figure, the Shah himself, who micromanaged almost every affair of the government. This matter in fact, had paved the way for favoritism by those who had found their way in the circle of power and therefore became an important element of negative propaganda against the Shah by those who were unhappy with such atmosphere in society. About a year after Khomeini was sent to exile, Prime Minister Hassan-Ali Mansur was assassinated by "Fadaian Islam" in January of 1965 which allegedly was carried with assistance of Akbar Hashemi-Rafsanjani. Mansur was from a new generation of politicians with a long family history in politics and links to Qajar aristocracy. His plans for deep economic reforms which started with a sharp rise in price of gasoline and bus fares was confronted with violent reaction in demonstrations of university students in Tehran and nationwide strike by cab drivers. Consequently, gasoline prices and bus fares dropped back significantly to settle the unrest in society but this was not enough for those who wanted to disrupt the process of development of the nation. Shortly afterwards, an Islamic fanatic, Mohammad Bokharaee, shot Prime Minister Mansur in front of national parliament's door and he died in hospital a few days later. He was followed by Amir-Abbas Hoveyda who was a close friend and associate. Before I discuss the era of Mr. Hoveyda's premiership, I would like to take a look at some issues that have left their marks on the history of our nation and influenced the political path that our nation has followed after that. The stories of corruption and shortcomings in government and all organizations related to that prior to Islamic Revolution is undoubtedly not unique to Iran (even though Iran was not comparable with most of other nations in that regard) but this matter had most definitely created best opportunities for manipulation of portions of the society by enemies (both internal and external) in direction of their own interests through any means possible. Formation of Rastakhiz Party by direct order from Shah in 1975, which has remained a mystery till this day, provided more ammunition to those who wanted him and the system that he represented to be gone for good. This was a year after Shah had been diagnosed with some form of mild lymphoma sickness which was later identified as "human T-cell leukemia", a deadly disease that was not seen among humans much earlier and is closely related to "acquired immuno-deficiency syndrome" (AIDS) virus that according to Dr. Len Horrowitz, was artificially made in the labs of BIONETICS company (a contractor for US army in the field of BIO weapons), under direction of Dr. Robert Gallo. Based on a brief report from "Health News Network" on history of human experimentation by US government, HTLV (Human T-cell Leukemia Virus) was initiated in Fort Detrick's Center for Biological Warfare Research for US Navy which was renamed later as "Fredrick Cancer Research Facilities". The argument about involvement of US government in human experimentation for creating biological and chemical weapons which has also been brought up in some unfounded stories by some concpiracy theorists to taint the atmosphere with misinformation, is a well established fact that was proved in the court of law which ordered the government of United States to pay damages to families of some victims during 1990's. Eileen Welsome, a journalist in a small town in United States accidentally discovered some discarded government documents which contained information about the human experimentation which was conducted by US government on American citizens during the years of WWII and afterwards, to make certain materials that could produce desired effects on people in direction of objectives of US military and government. Discovery of those documents directed Eileen Welsome on a path of research that resulted in a great book that she won the Pulitzer prize for that. The documents presented in this book which is named "Plutonium File" became the foundation for a lawsuit on behalf of victims of human experimentation against the government of United States that ended with victory of the families of victims which were awarded one million dollar each at the end. It is obvious that such matters have never been limited to this particular case and it is reasonable to believe that these kinds of experimentation have been conducted in more than one area with variety of results. Shah's illness was kept not only from public but also from all those who were very close to him as in the beginning, neither Shah himself nor his doctor believed that his life would be under any danger. It is said that, during the last visit to US before his sickness, Shah and his court minister, Alam, both underwent a full medical checkup without finding anything significant and yet they both became ill not much longer after that. US Ambassador, Richard Helms, who had received the information about the illness of Shah from General Hussein Fardoust in 1976, reported that to Washington and according to Fara (Faramarz) Mansoor who allegedly has access to some secret documents about activities of US intelligence service in Iran before 1979, G.H.W. Bush who was the head of CIA at that time, sent a secret memo to Helms inquiring about mental state and quality of decision making of Shah and the effect of his illness on such activities. This matter indicates that head of CIA was fully aware of the situation and the initial effects of such illness in preliminary stages before it completely deteriorates the health of patient and ends his life. During the years after 1953 to 1979, in multiple occasions, CIA had requested assessment from its field officers in Iran regarding possible effects in the government system if the Shah was taken out of the scene either through assassination or illness. This kind of information combined with more than one coup attempts against the Shah in which, CIA allegedly had a hand, makes one wonder about the nature of relations of US government with Iran and the late Shah and their real intentions in such regards. During the years after creation of CIS (Confederation of Iranian Students), their activities against Iranian government grew and, the organization continued to recruit new Iranian students that their number in United States was increasing rapidly. The first major demonstration of CIS members against Shah occurred in front of the White House during his visit to President Kennedy in 1962. Sadegh Ghotbzadeh who had no success in his academic career in United States at that time, was among the leaders of that organization who paid a visit to Robert Kennedy, who was the Attorney General of United States at that time, before going to the area around White House and chant slogans against Shah. Ardeshir Zahedi who was Iranian Ambassador to US at that time has recalled this meeting between students and Robert Kennedy later in a meeting with US Ambassador in Iran. In that conversation which was reported by US Ambassador to Washington, Mr. Zahedi also mentioned that Robert Kennedy had presented all Iranian students who met him with a ball point pen (new at that time) which was decorated with his own picture! 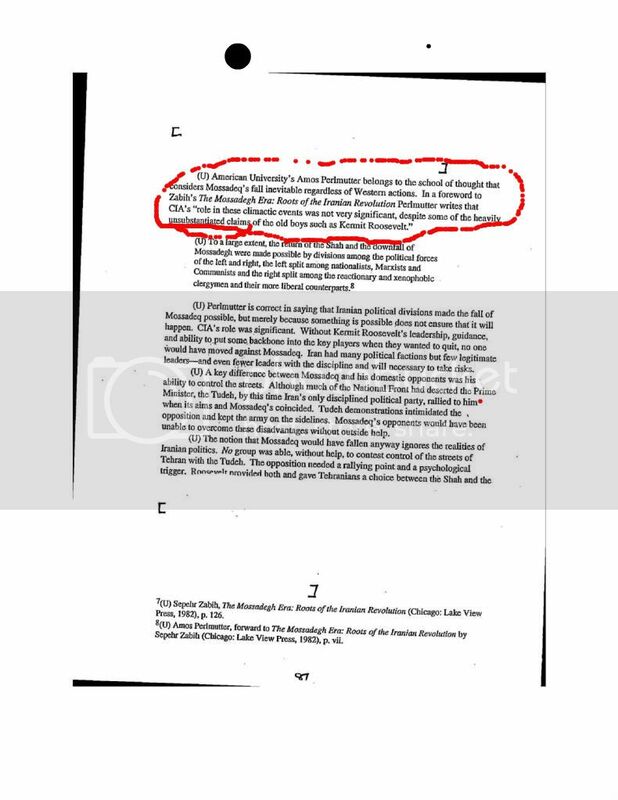 This matter is also confirmed by Carrol Jerome (Ghotbzadeh's girl friend) in her book,"Man in The Mirror". Increasing organized activities of CIS in their opposition to Iranian government which spread throughout the western world became a matter of concern because, due to lack of enough educational institutions at graduate and post graduate levels, Iran needed to send students outside the country in order to take advantage of European and American academic facilities and arm the new generation with the required scientific and technological skills that were needed for national development in different fields. Start of the armed rebellion and guerrilla war against Iranian government by some remnants of Tudeh Party's youth organization and other newly created communist groups which were mainly made of young graduates during the same period of time was an indication that Iranian young generation seemed to have found such activities very attractive. Exaggerated views and rumors about oppressiveness and power of Iranian security police (SAVAK) might have contributed in creating and spreading such tendencies to resist and fight among a portion of younger generation which tends to rebel easily by nature. Considering the wide spread propaganda about leftist rebellion throughout a bipolar world in which communism was very fashionable and attractive, young Iranians and young generation in other under-developed countries, were easy victims to fall for such unrealistic and false promises of social justice and prosperity. It was under such circumstances that in the year 1971, a CIA humiliation broke out by an Iranian student claiming that he was recruited by CIA to work with CIS (Confederation of Iranian Students) and gave an interview to news papers in Tehran under guidance of SAVAK and the story was ready to be broadcasted on Iranian national TV. This matter caused an unpleasant wave in relations between the two governments. Shah was very angry to hear about such developments while American Ambassador was working hard through his contacts (the ministers of royal court, Alam, and foreign affairs, Zahedi) to control the situation and prevent the escalation of the issue into real difference between the two nations. This matter that US intelligence agency was involved in stirring opposition against Iranian government through CIS was a surprise for many Iranians but to others who were aware of previous events and activities against Shah with CIA involvement, it was not such a crazy idea. 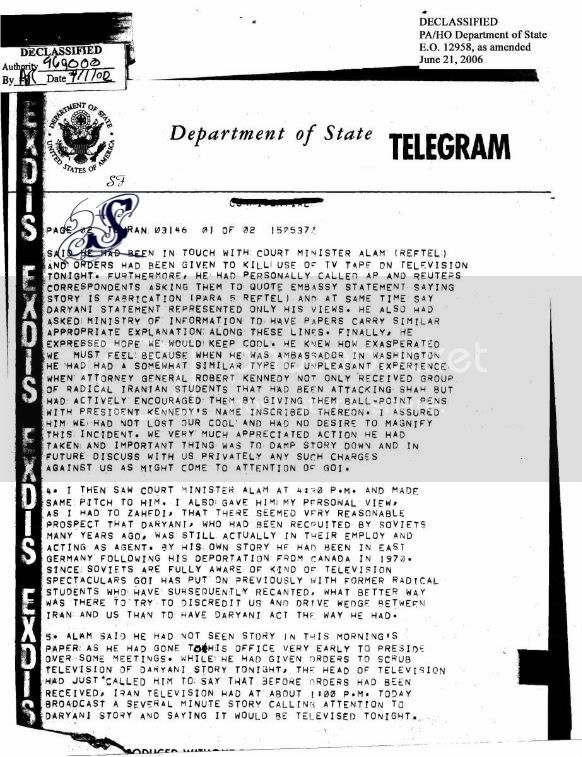 Finally, the matter was settled with the help of Mr. Alam and Ardeshir Zahedi who reminded US Ambassador of unpleasant experience of his own about demonstration of Iranian students (with a ball point pen from Robert Kennedy in their pockets) against Shah when he served as Ambassador to United States. US government blamed the whole event on communists. It is interesting to remember a conversation between Shah and Leonid Brezhnev in mid 1970's which happened in Moscow during which Shah thanked Brezhnev for excellent education and training that they provided to Iranian engineering students for steel mill factories and in return Brezhnev said: "If you want well trained students then always send them here but if you want well trained communists send them to US". After that humiliating event, Ghotbzadeh who had moved to France, along with a few other friends started an Islamic students organization to follow with the agenda which he had in mind and never spoke much about while working very hard to achieve it, the destruction of constitutional monarchy establishment and starting a republic system (probably with himself as permanent president). It is not clear that how many of Iranian students joined the Islamic students organization at that time but the organization later received the moral support of Ali Shariati who met the founding members in Paris and encouraged them to contact Khomeini because, in his view, Khomeini was different than other mullahs.